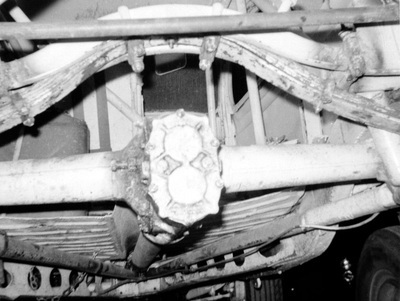 Out with the old flathead engines and in with the new overhead valve engines. 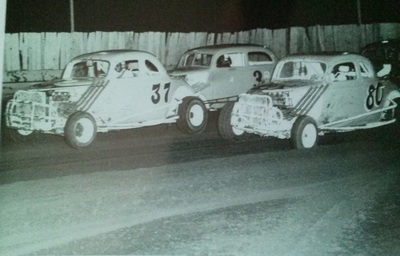 Small block Chevys and Fords dominated the scene. Early 1964 Rod Zanoline, before Ted Gratriex took over. 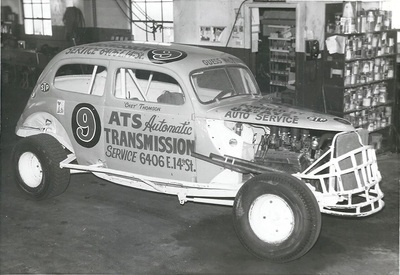 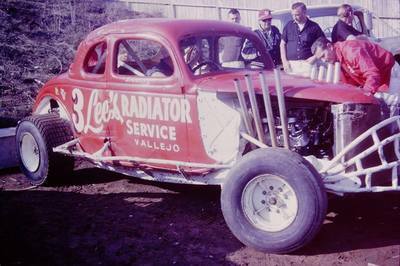 1963 Championship car driven by Leroy Geving. 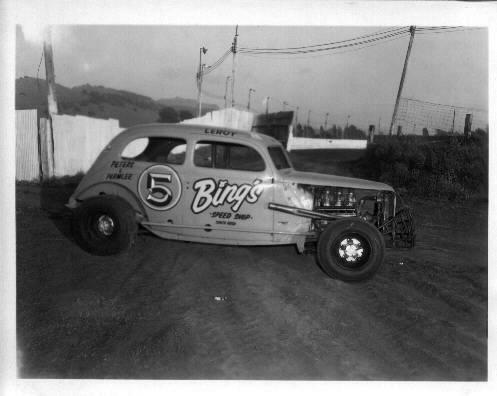 1964 Leroy Geving ride, the Ed Parmlee #5. 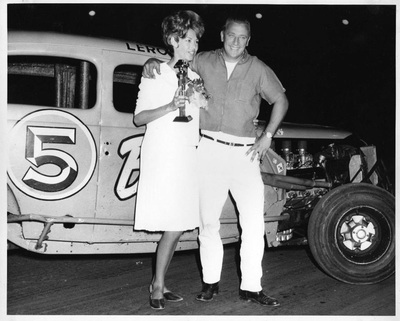 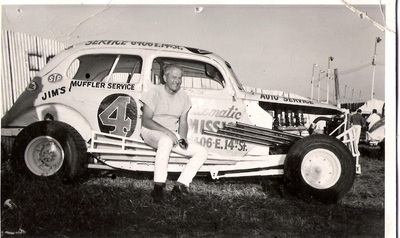 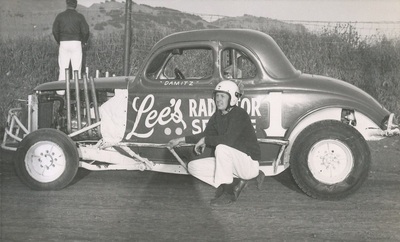 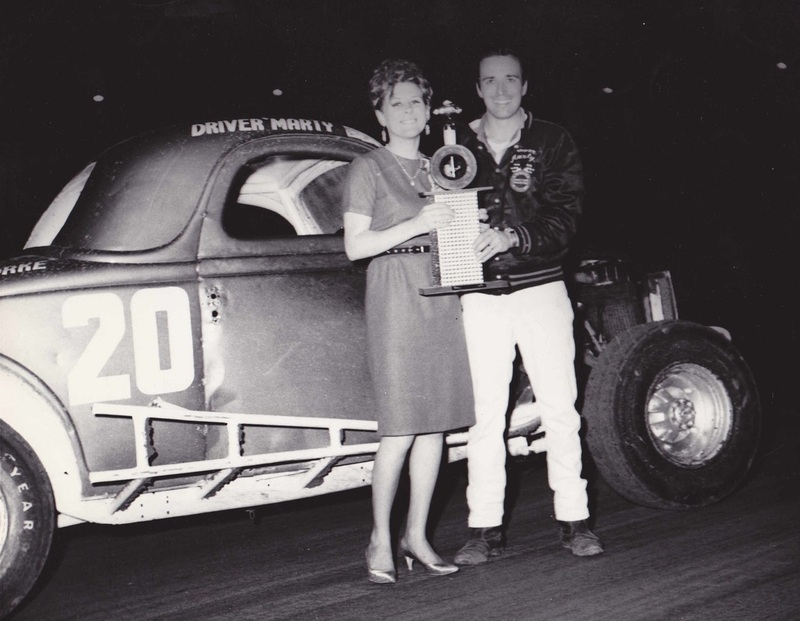 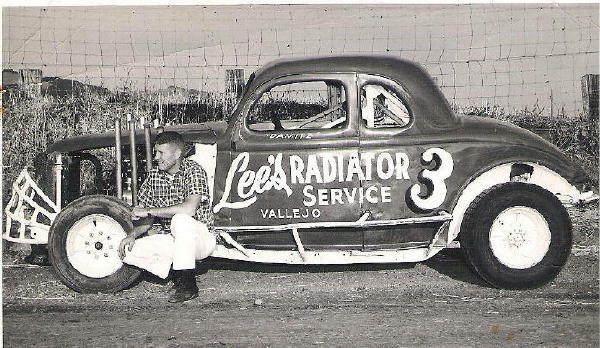 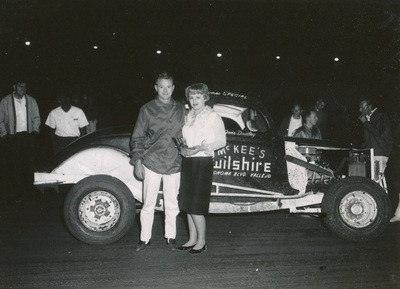 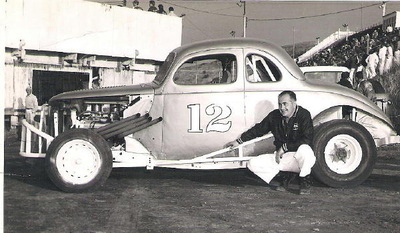 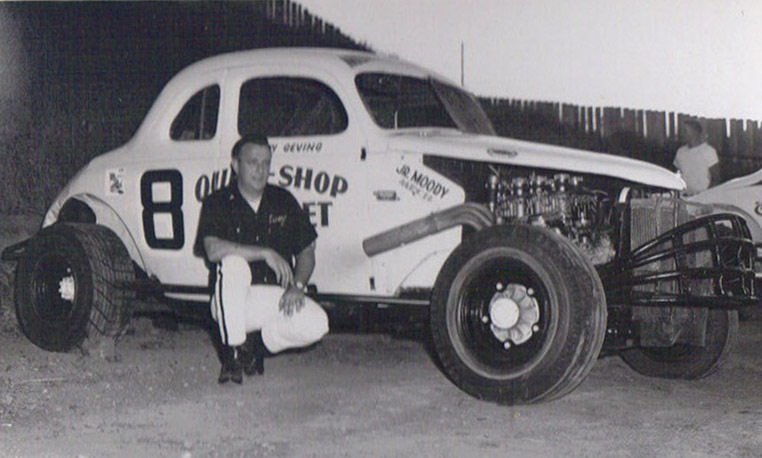 1964 Track Champ, Leroy Geving. 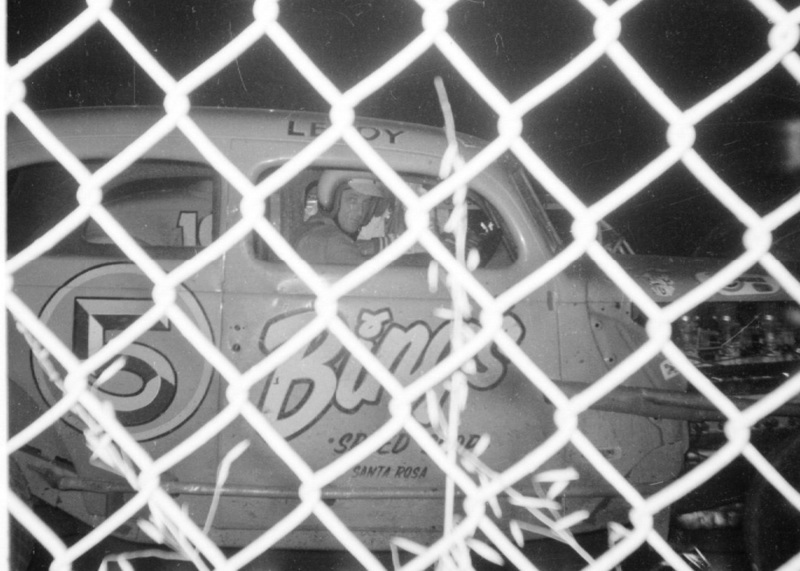 I yelled "Leroy", he responded. 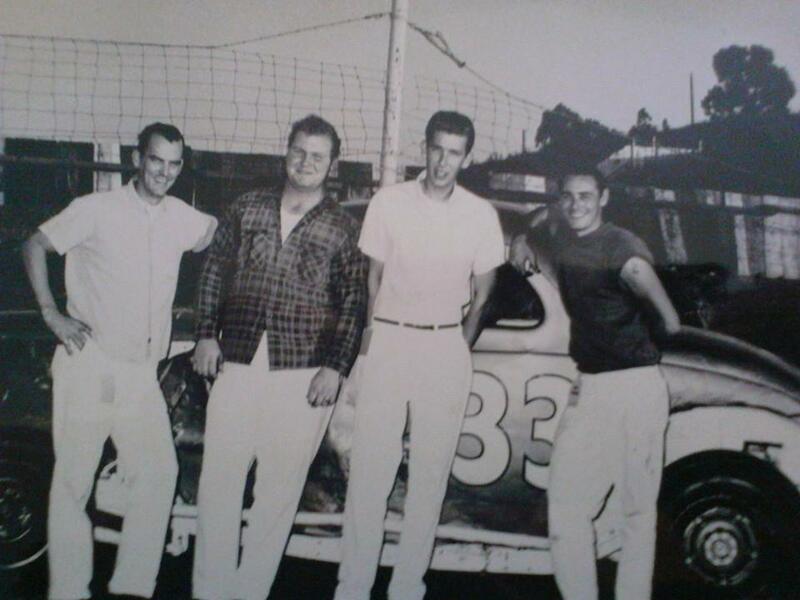 1964, 10 Ted Gratriex, 19 Ken Gandy, 2 Dave Logan, Don Snow pic. 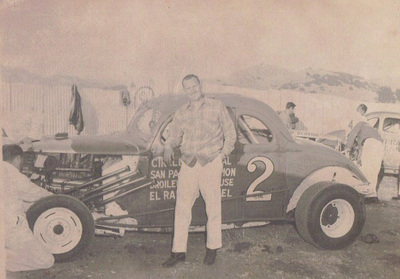 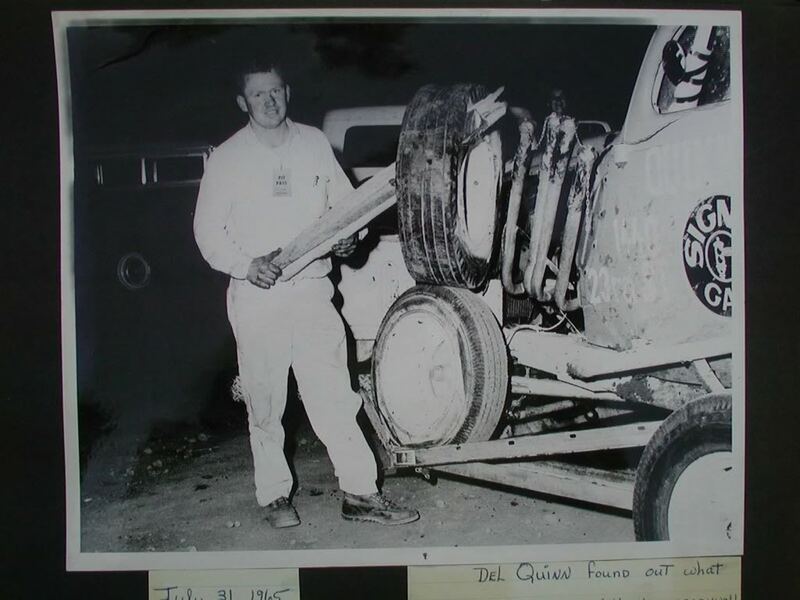 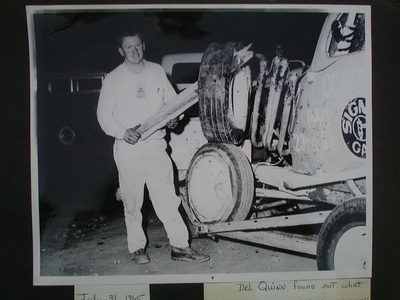 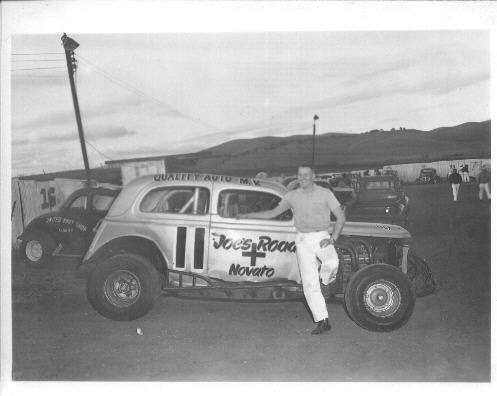 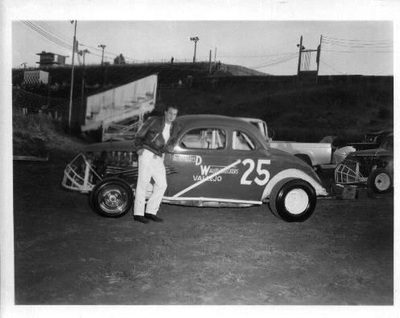 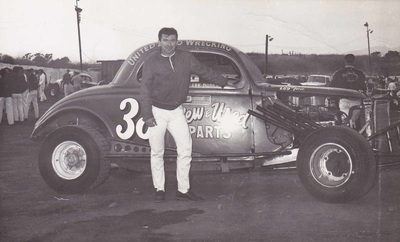 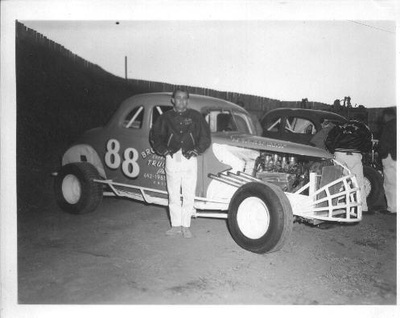 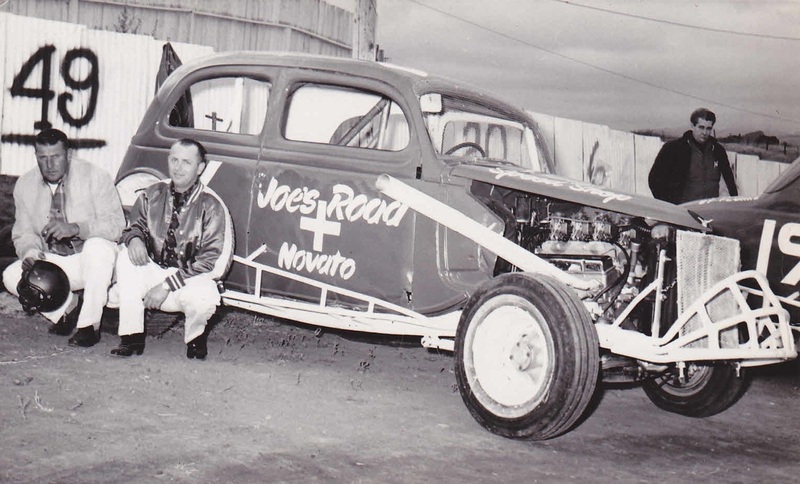 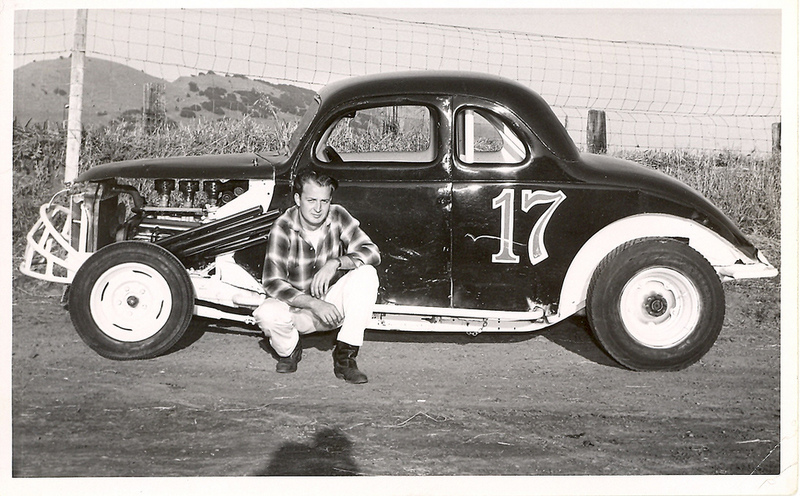 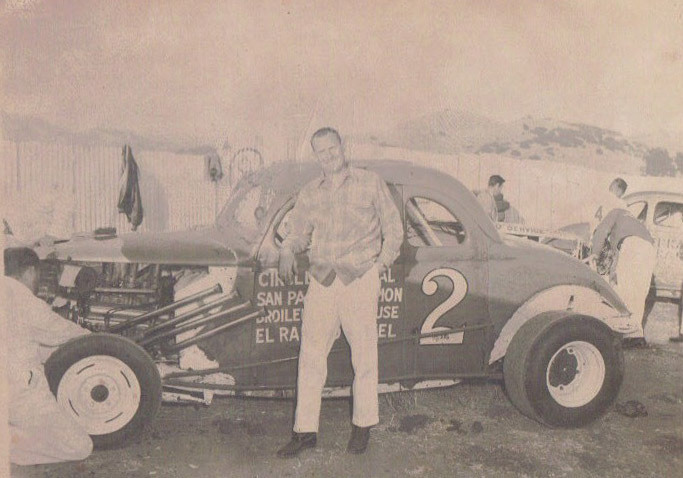 1964 Phil Pedlar with either a new car or 1965...Skip Brown pic. 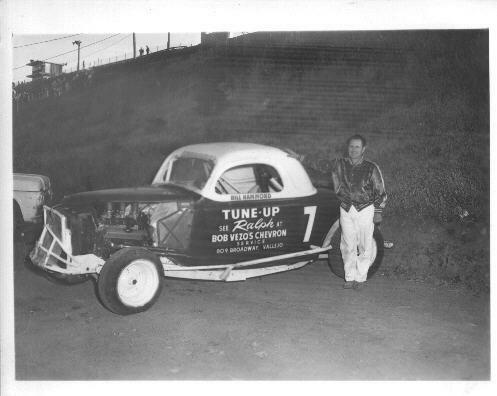 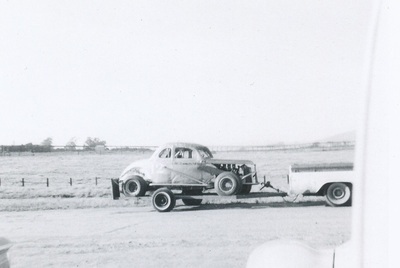 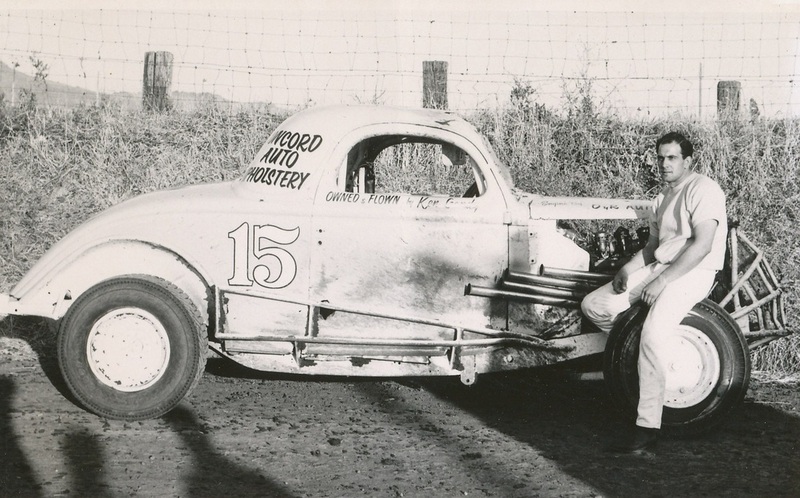 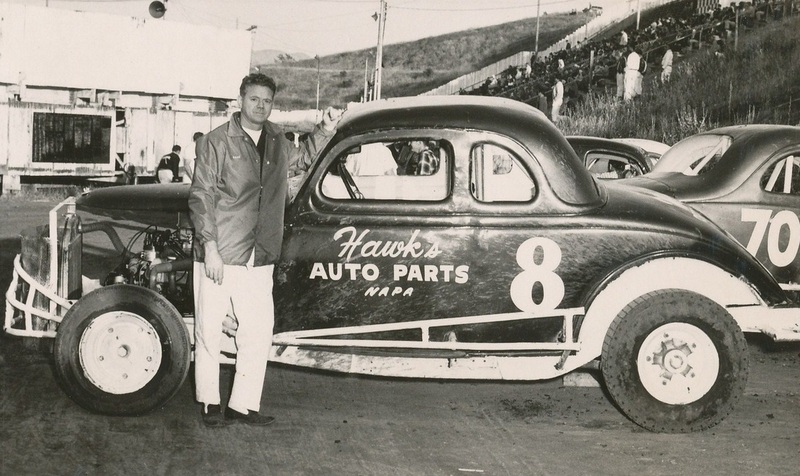 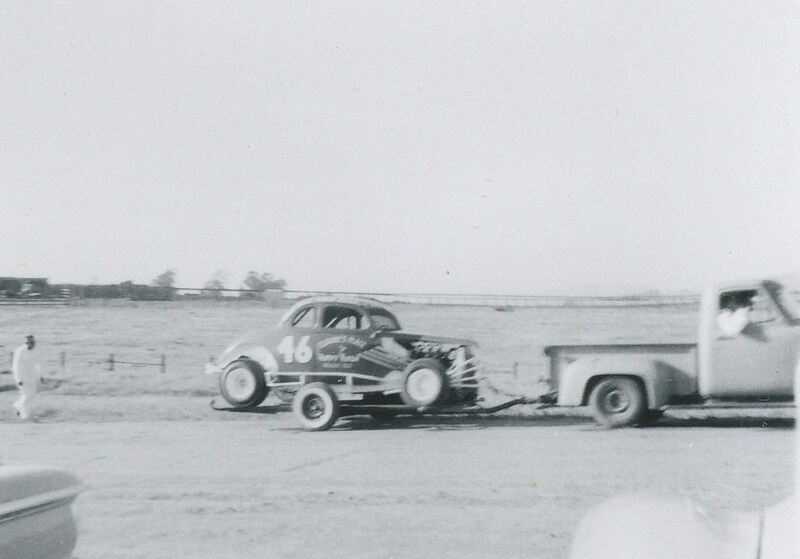 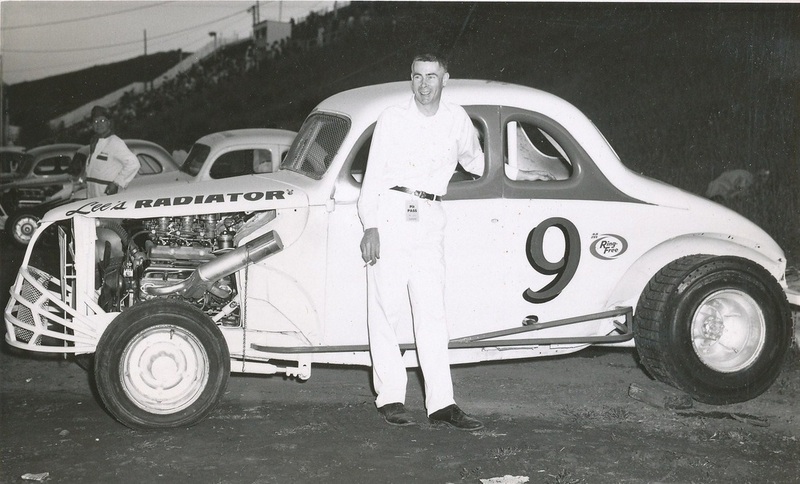 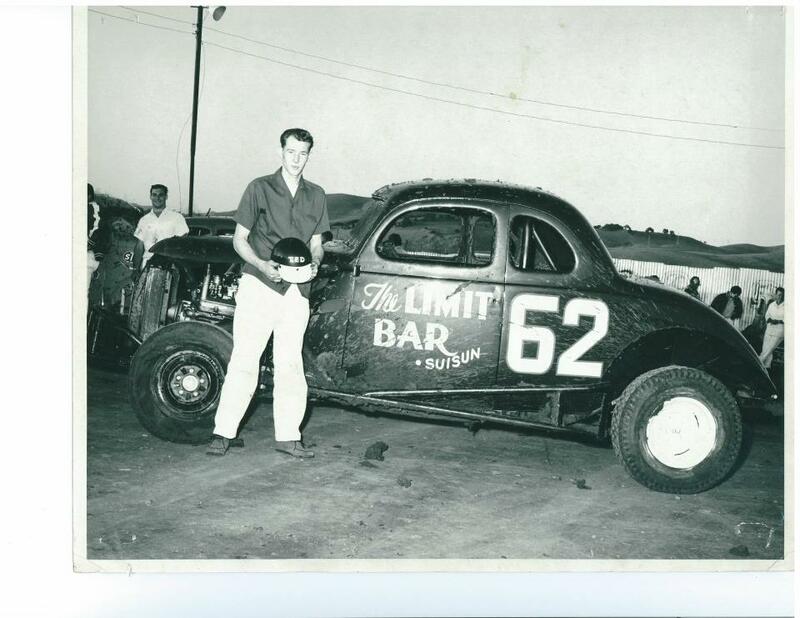 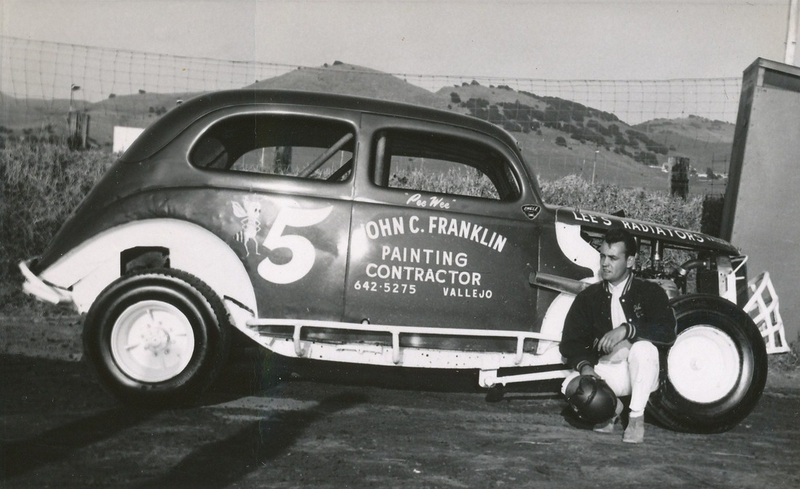 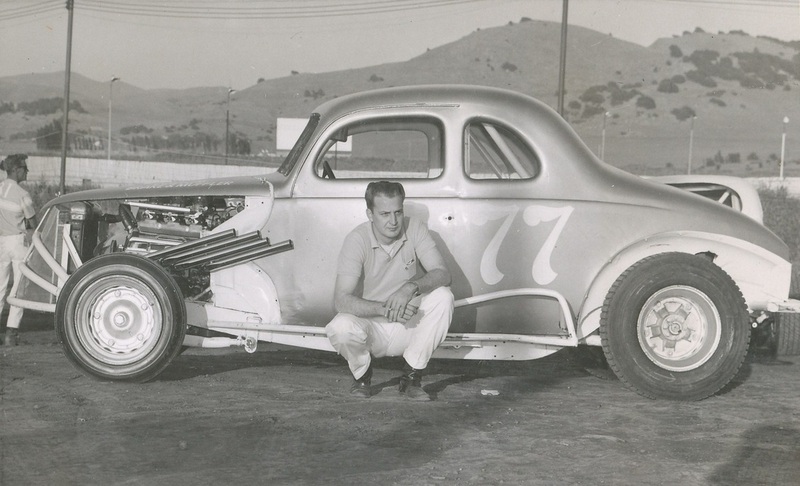 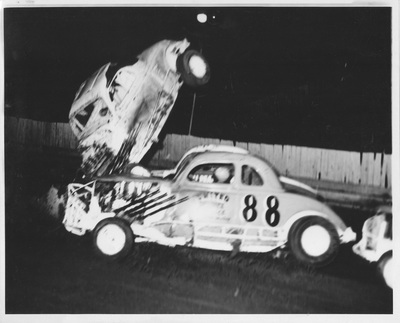 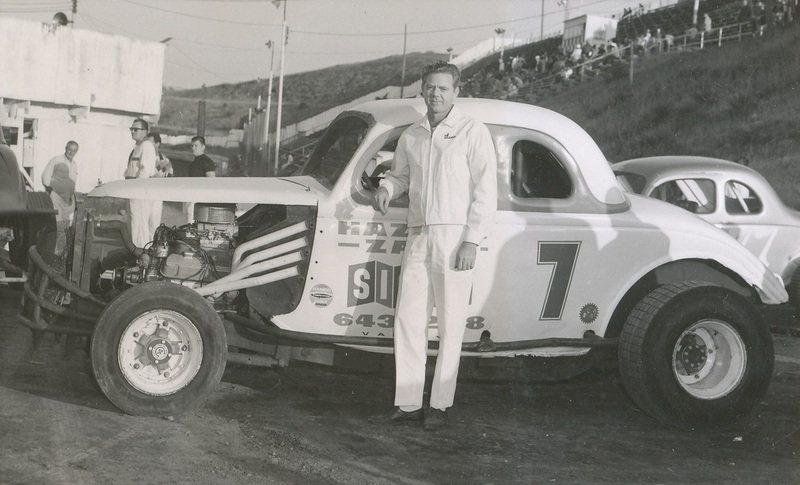 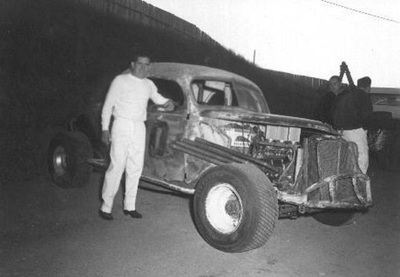 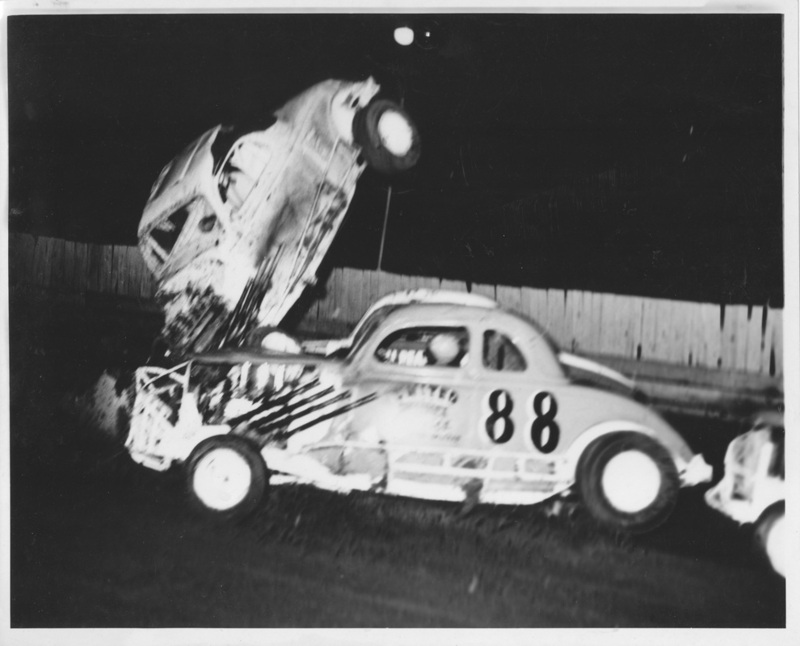 #68 Mick McGregor and an unidentified Ford coupe. 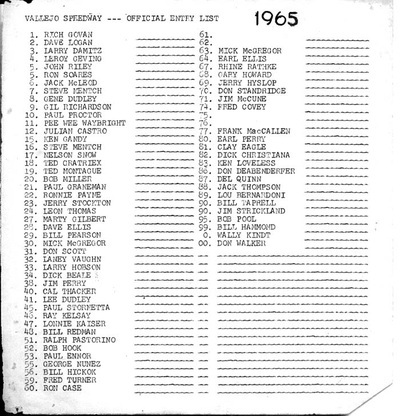 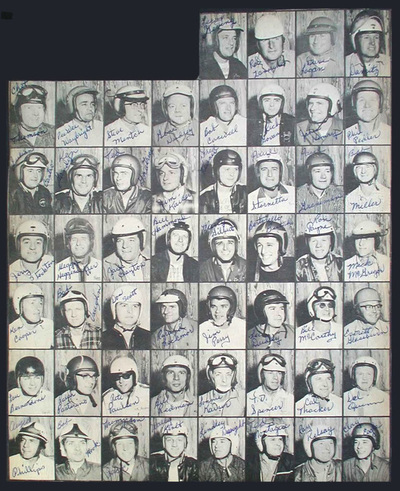 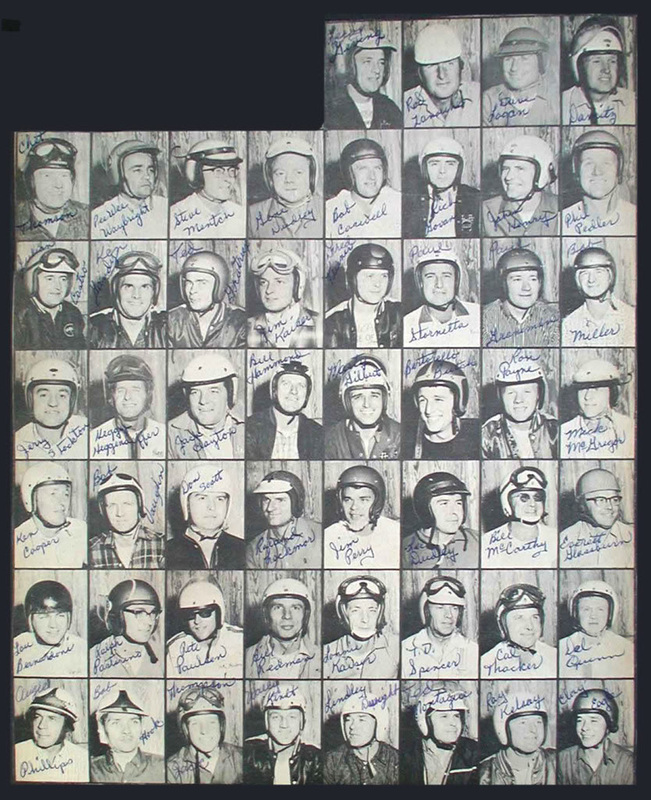 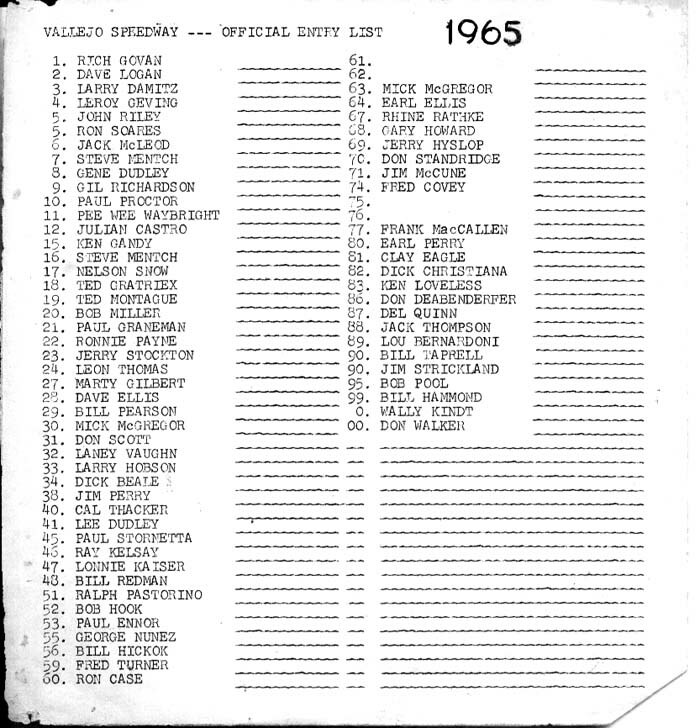 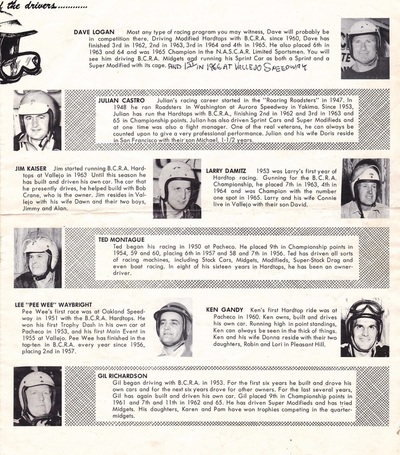 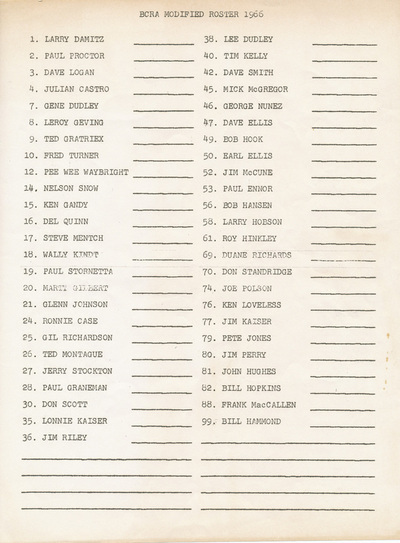 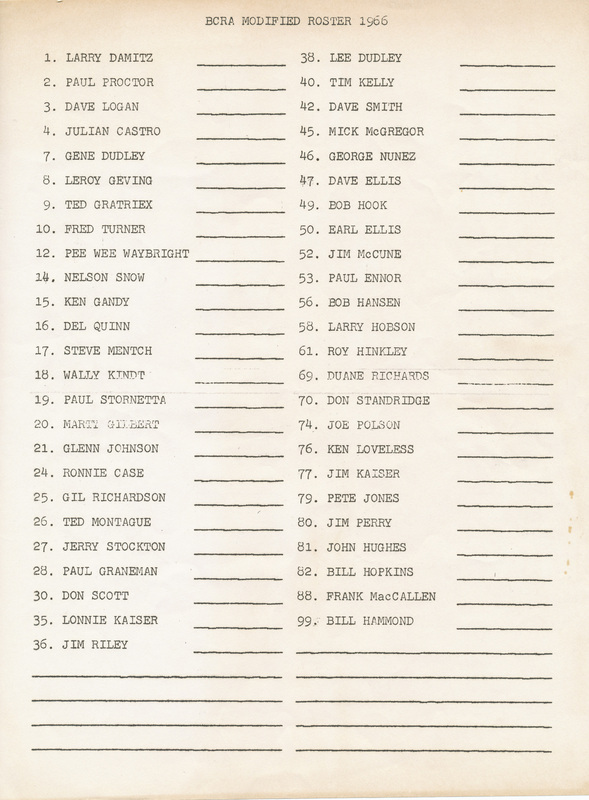 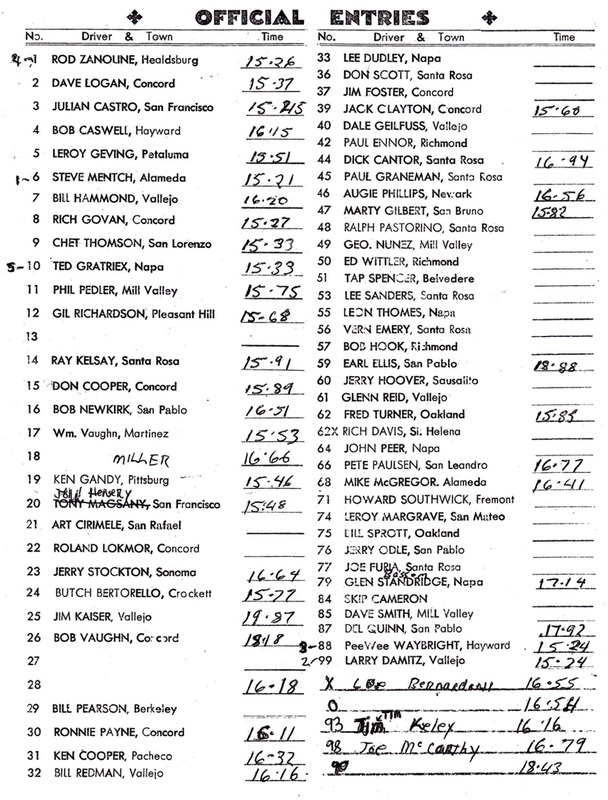 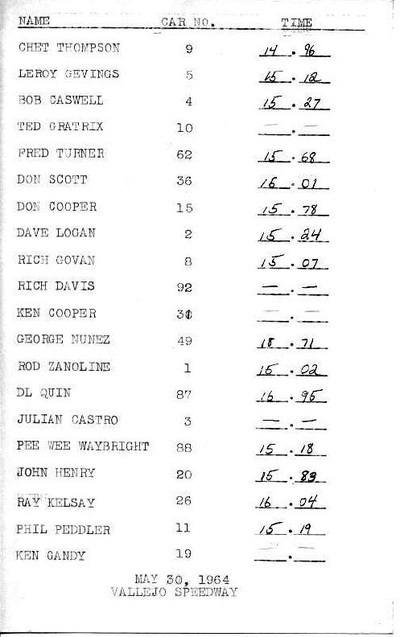 1964 Drivers Roster. 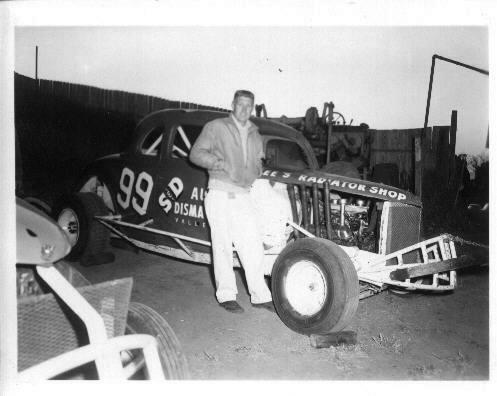 Skip Brown pic. 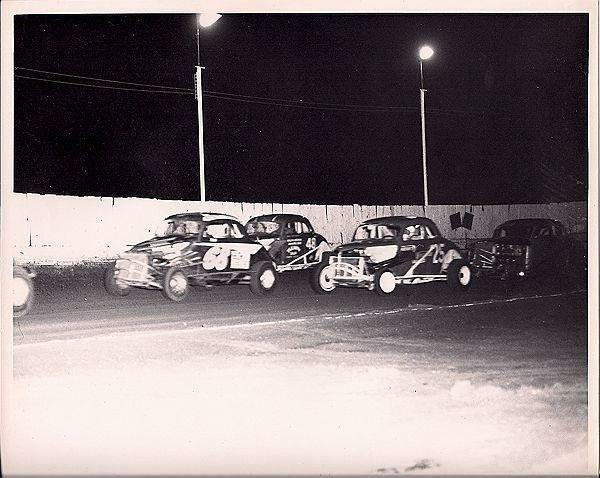 #7 Bill Hammond, #47 Marty Gilbert, #68 Mick McGregor, #67, unknown, #77 Paul Stornetta and #88 Pee Wee Waybright. Mick McGregor with #45 Paul Graneman and #25 Jim Kaiser following closely. Looks like Rich had to rebuild the car as it has different nerf bars as well as paint. 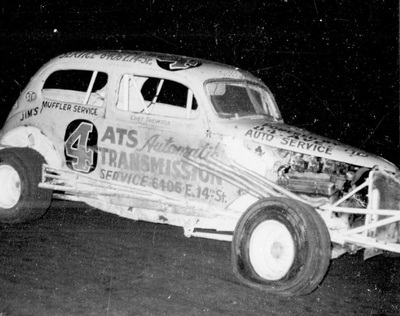 1965 Chet Thomson and the Bob Thomas #4. 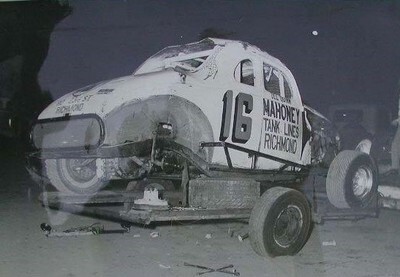 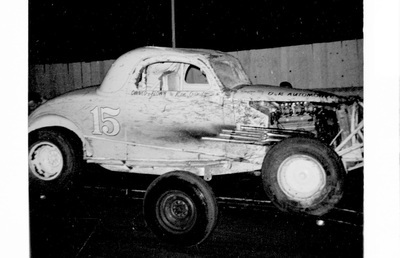 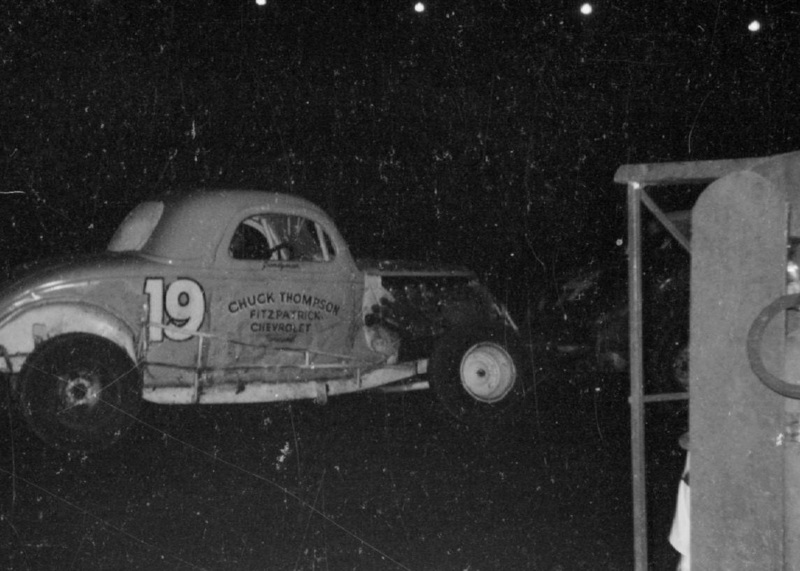 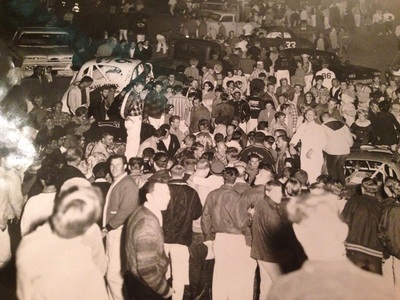 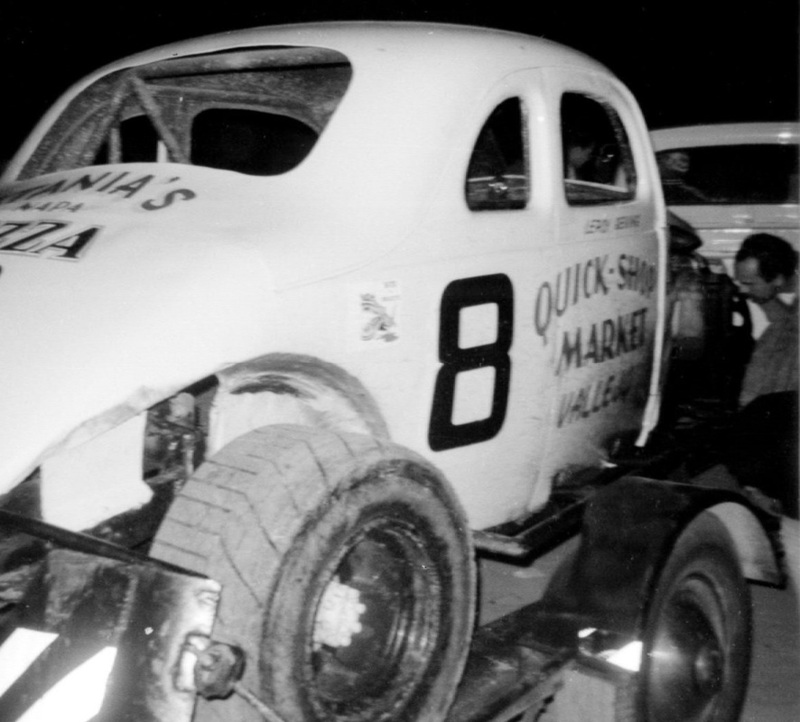 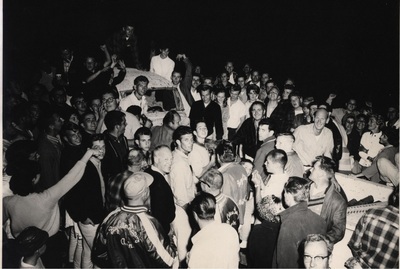 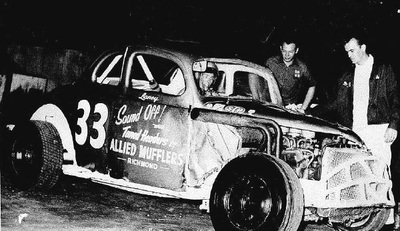 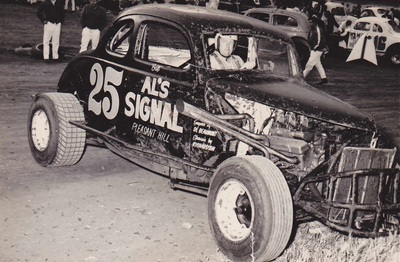 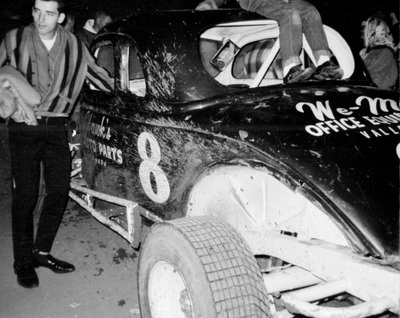 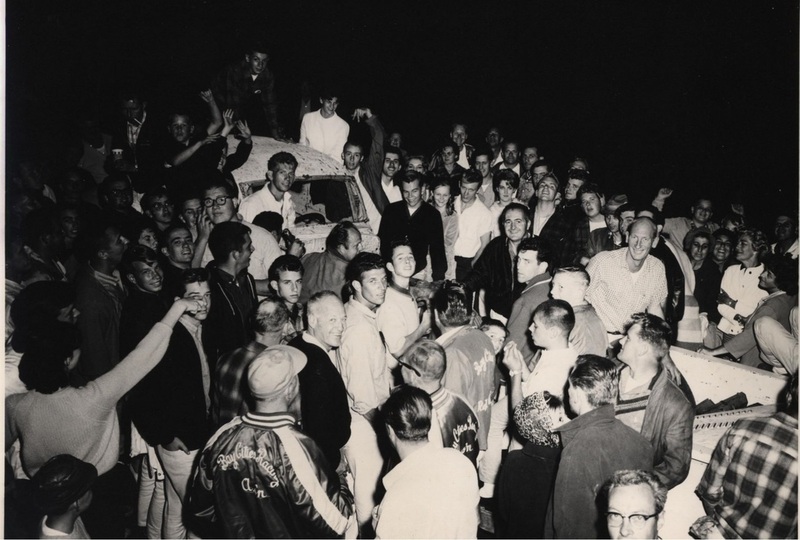 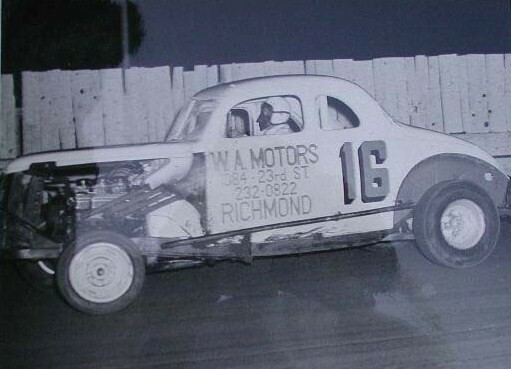 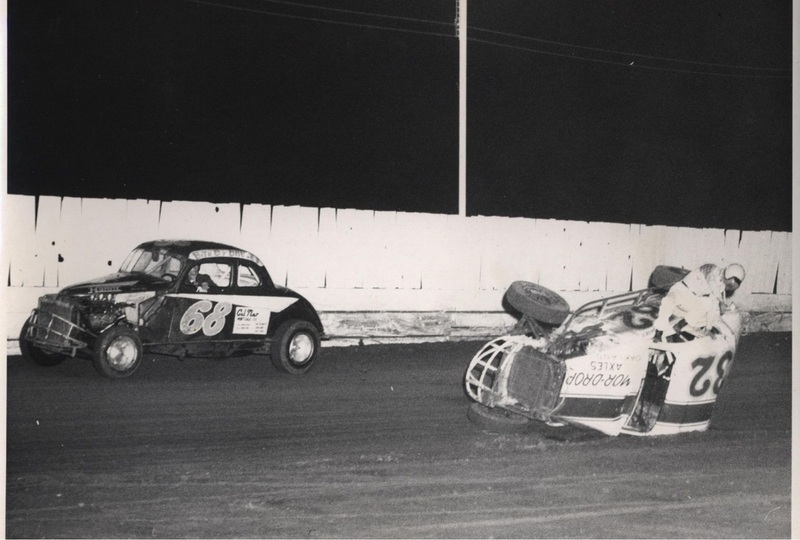 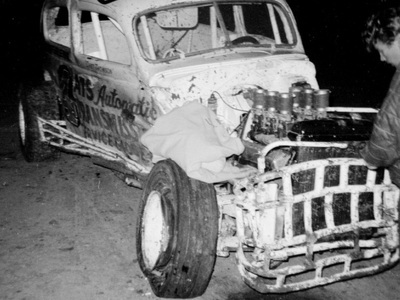 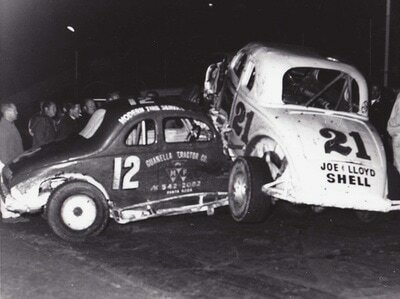 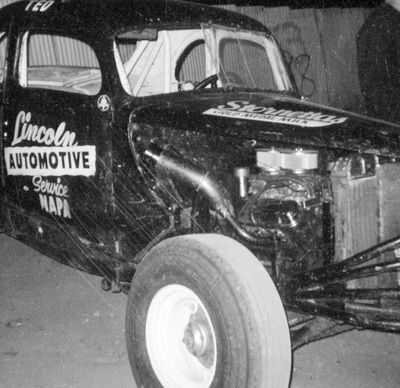 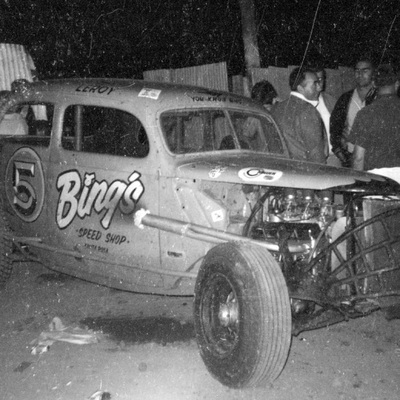 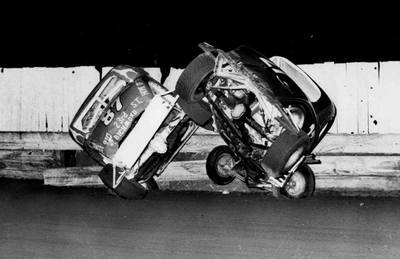 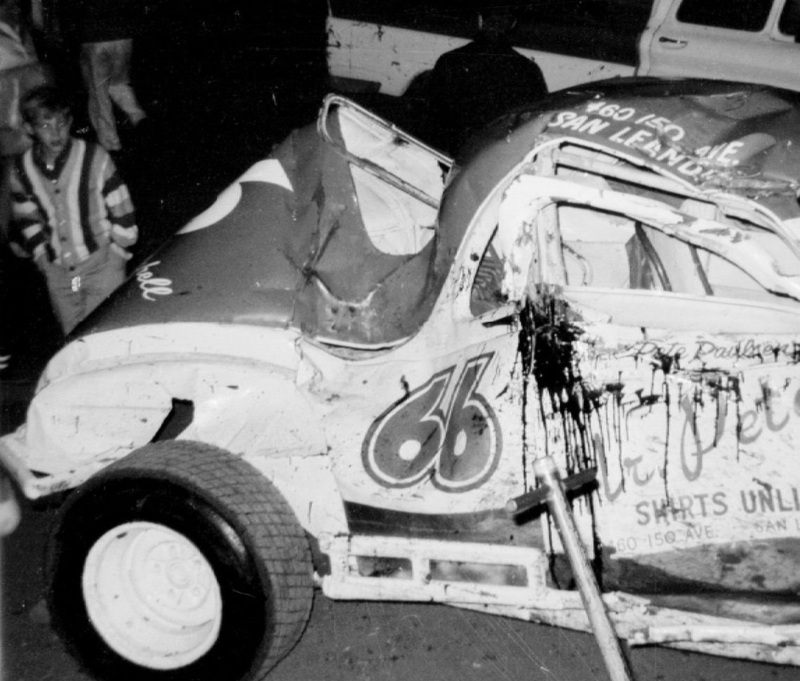 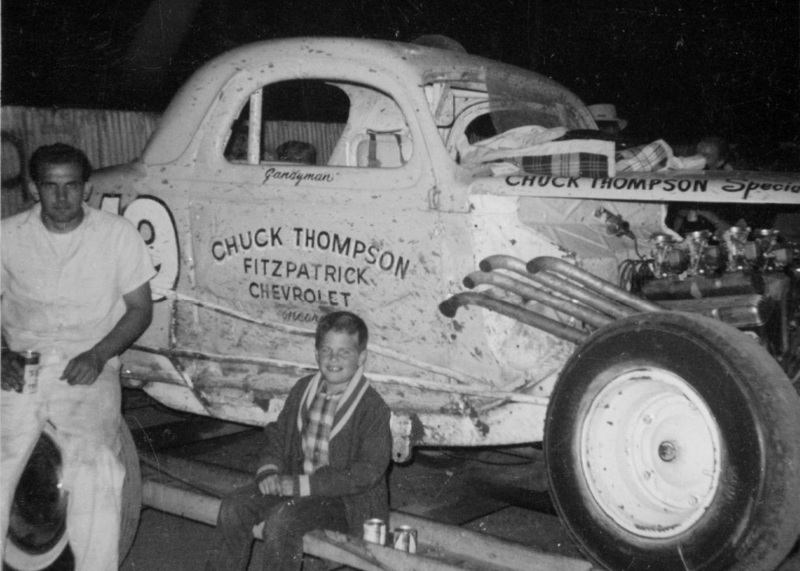 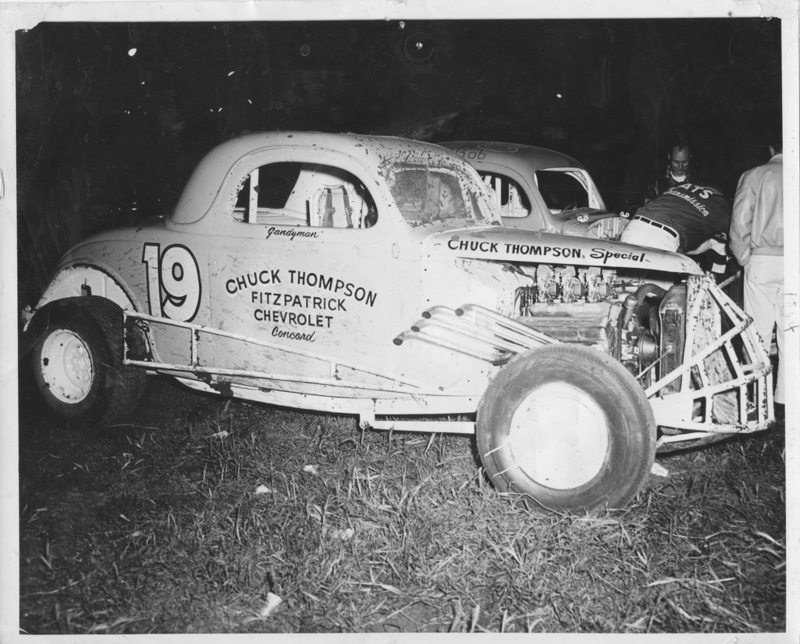 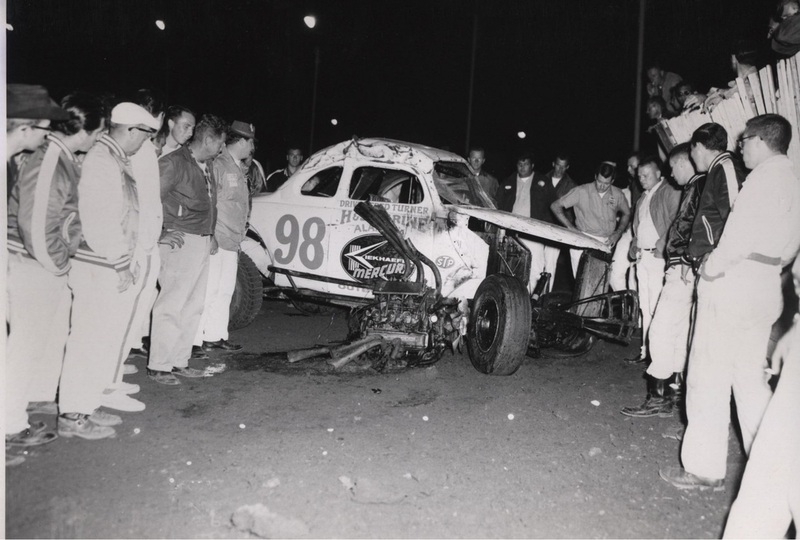 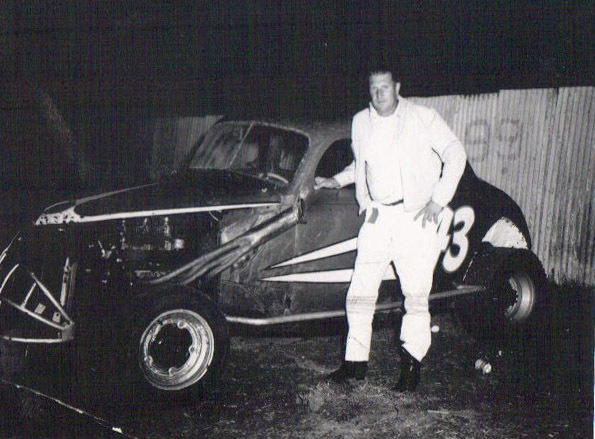 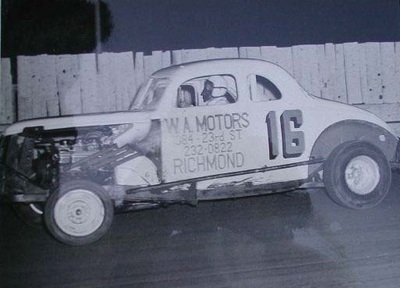 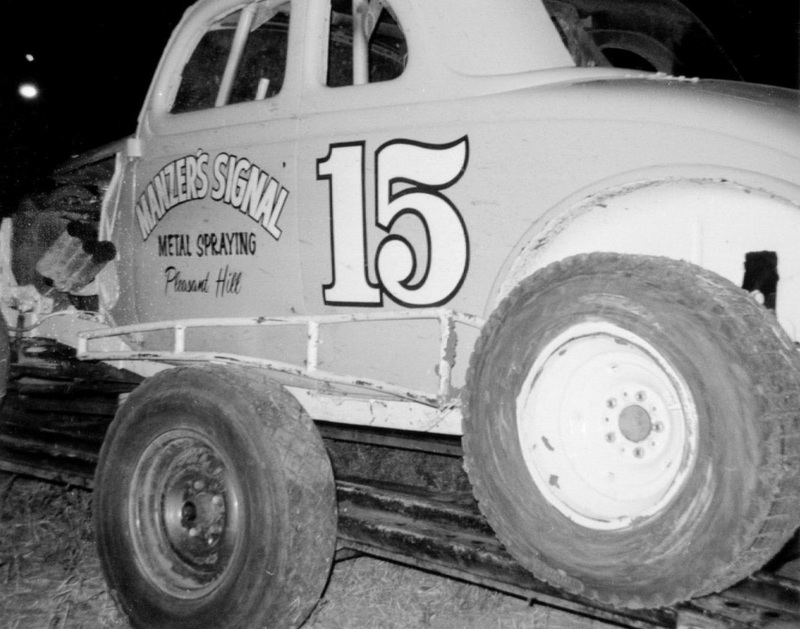 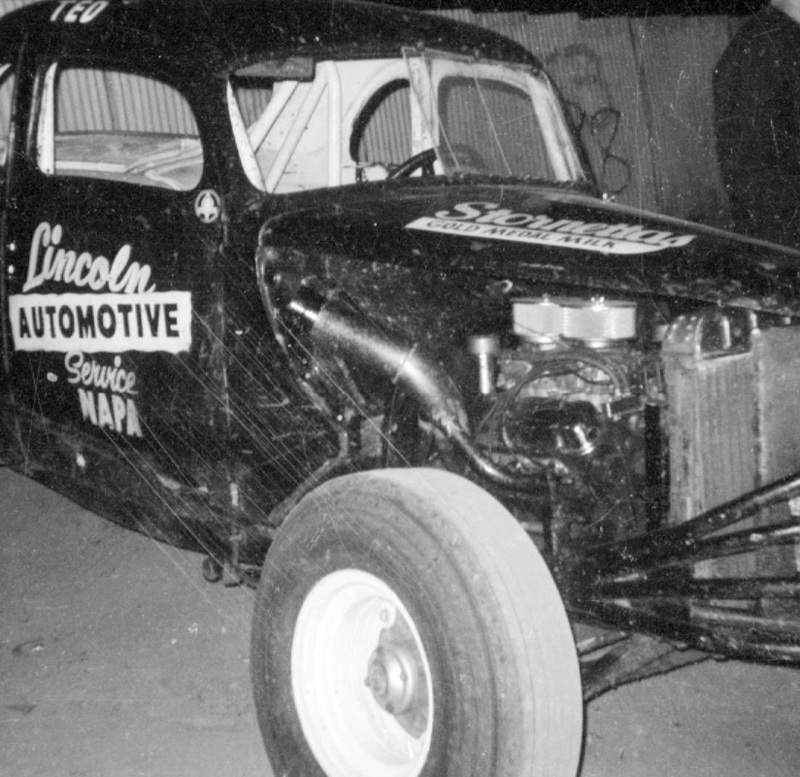 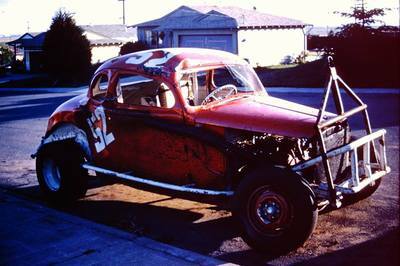 1965 Chet Thomson, rough night. 1965 Rich Govan stepped in for Chet this night and had a rough time. 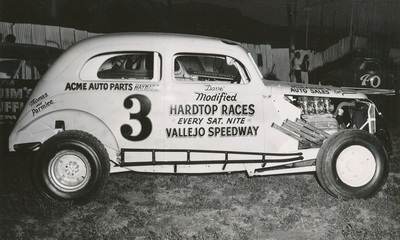 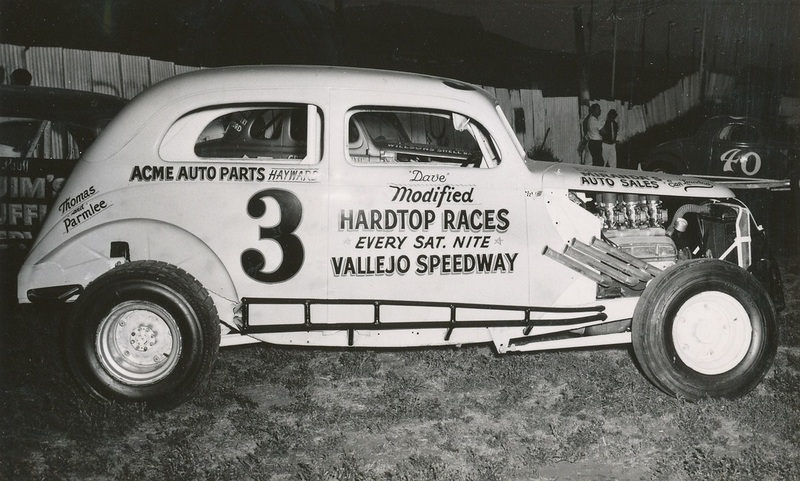 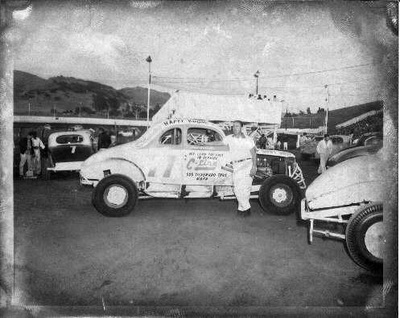 Leroy Geving later took over this ride after Chet stepped out due to medical issues. 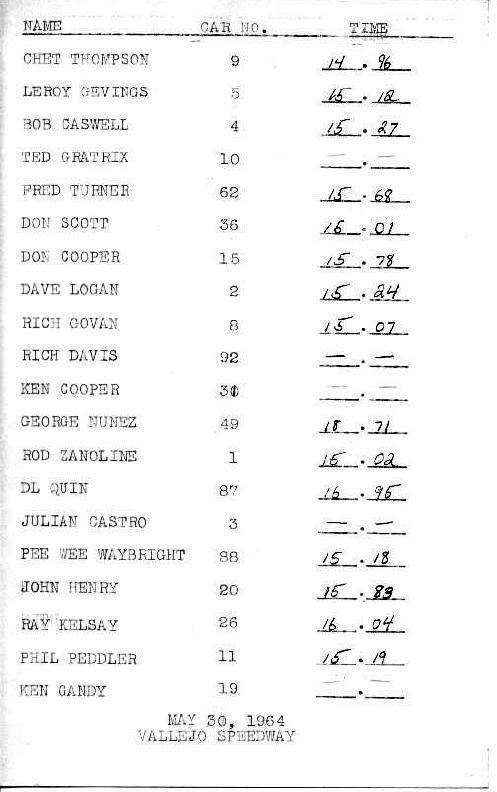 Thanks to Pete Paulsen for this information. 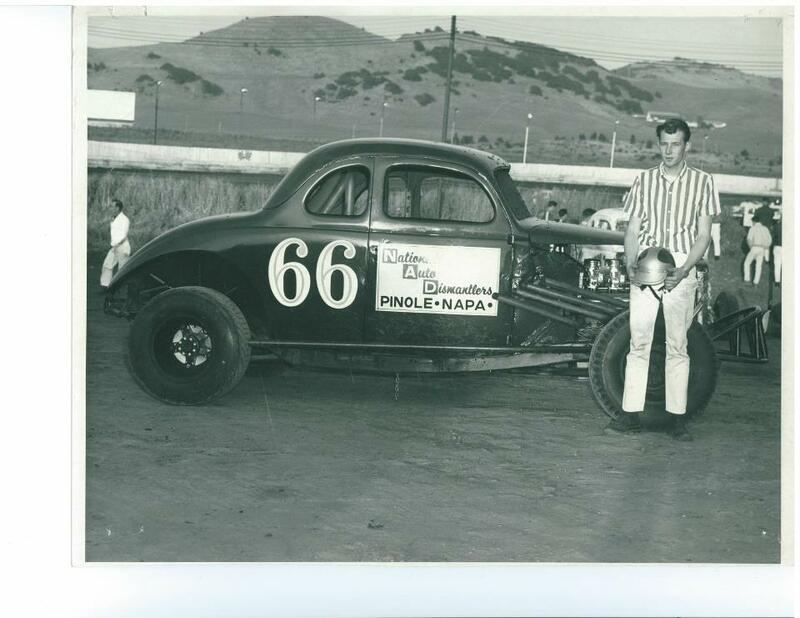 See Pete's car #66 below. 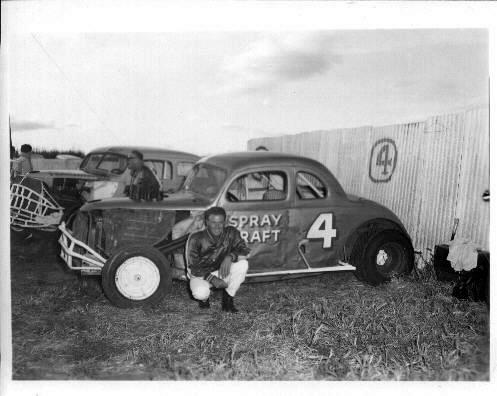 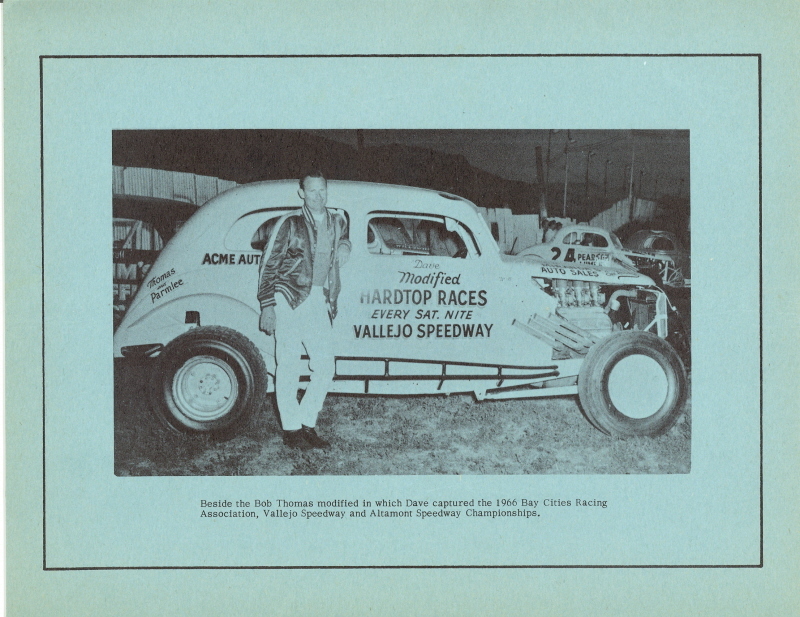 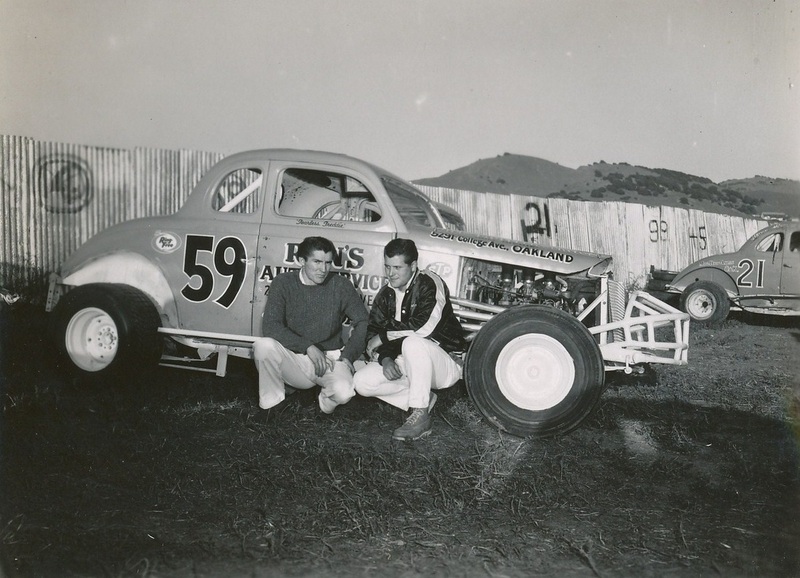 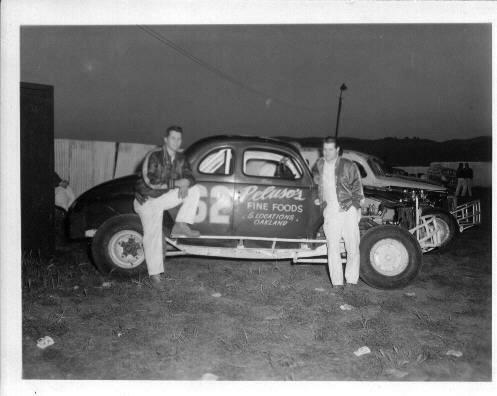 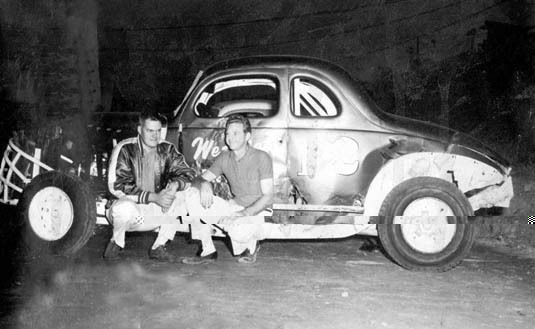 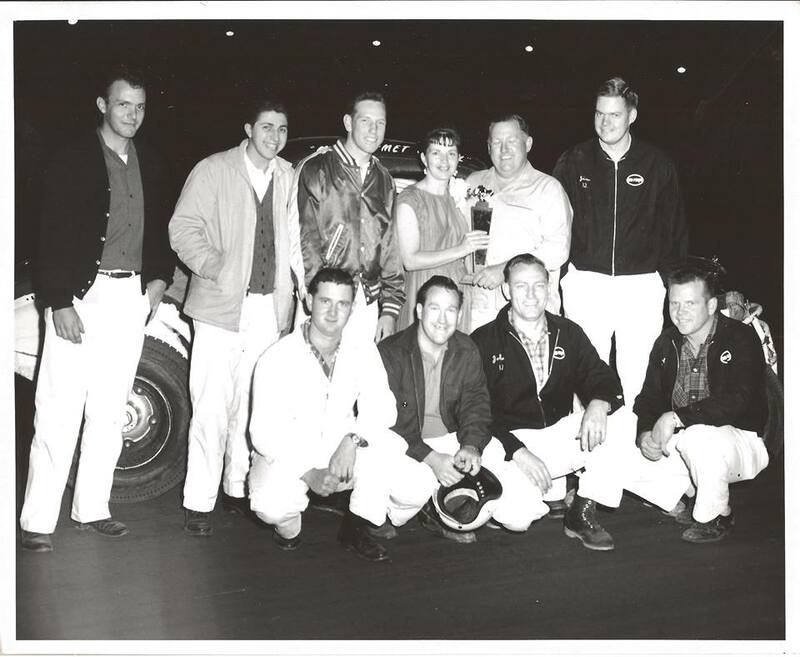 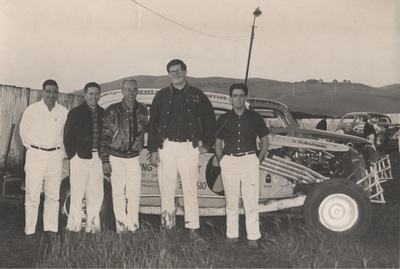 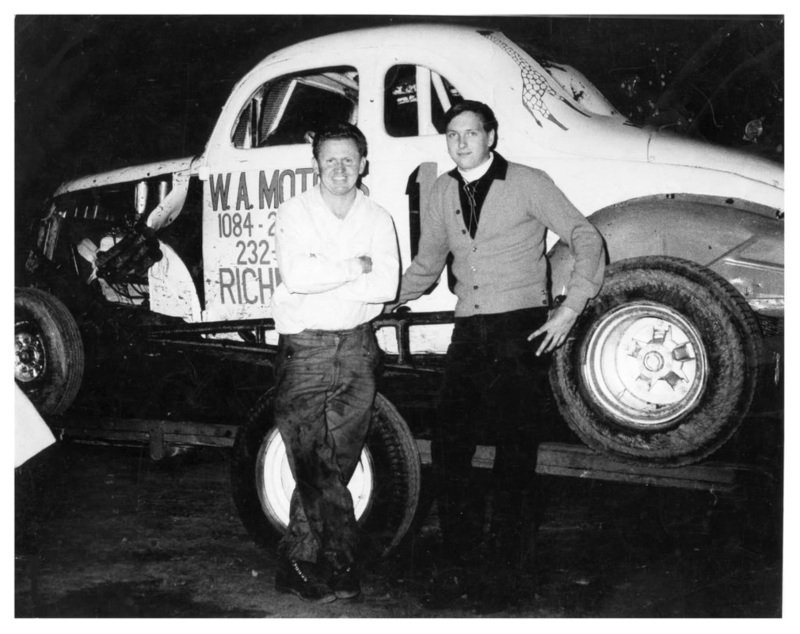 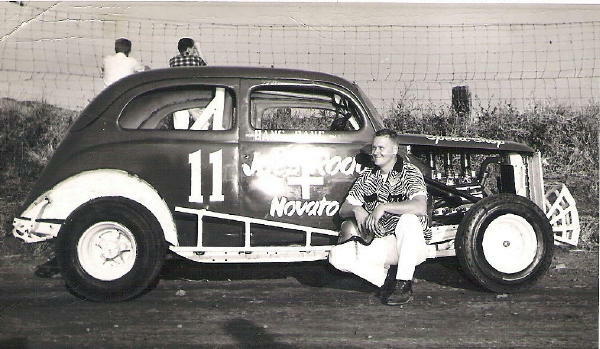 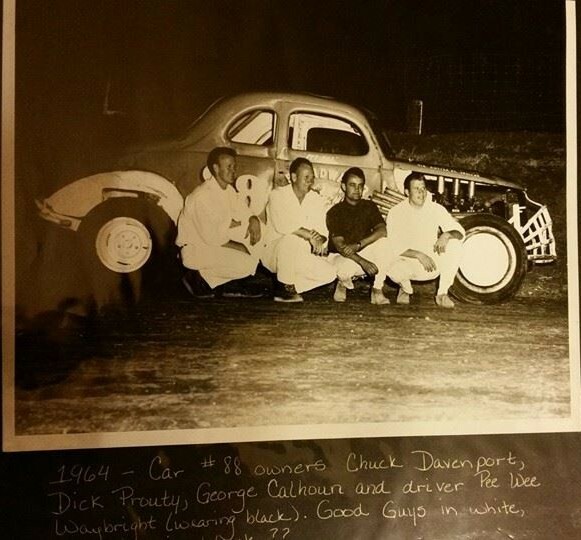 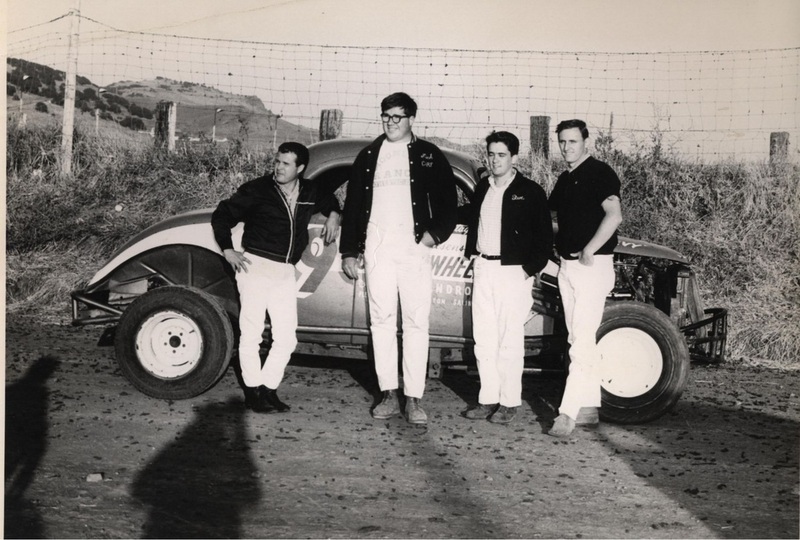 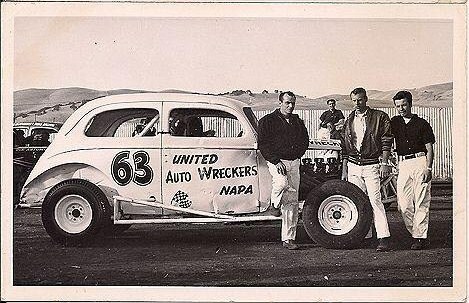 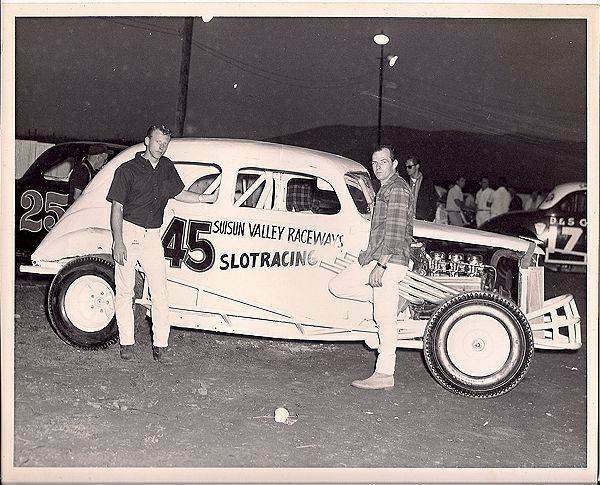 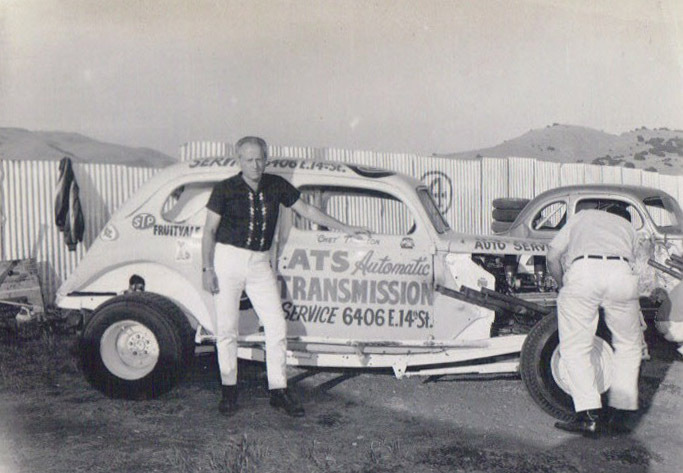 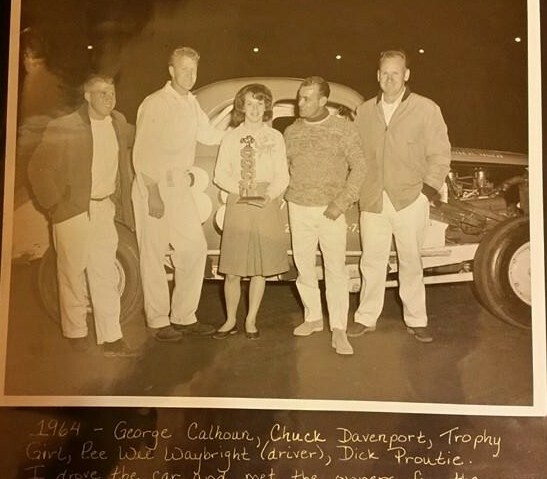 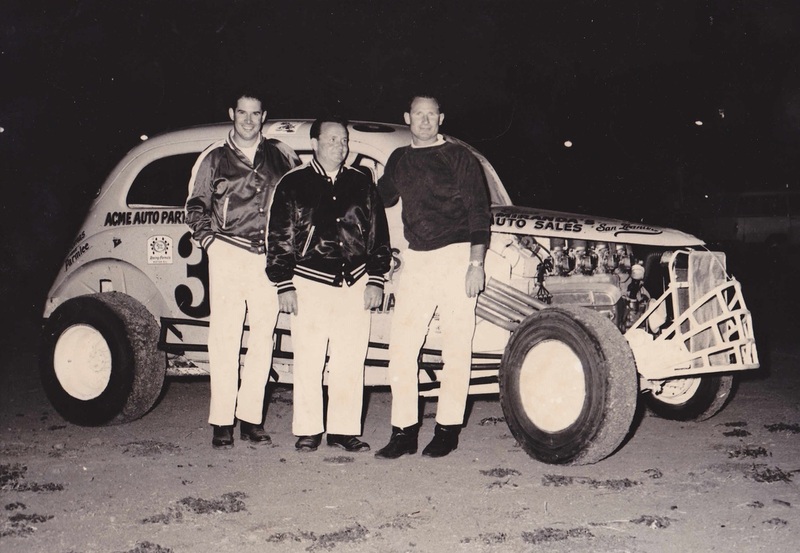 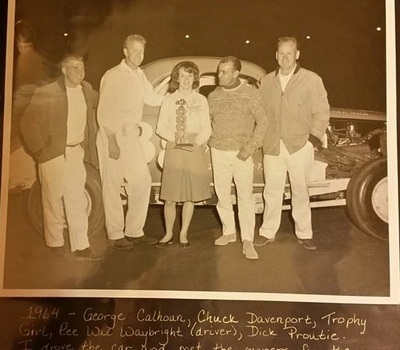 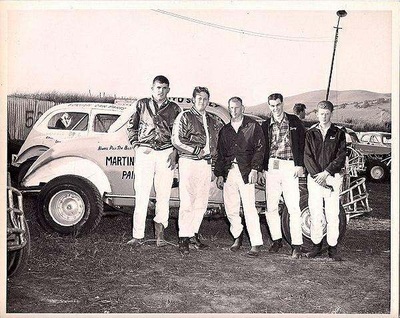 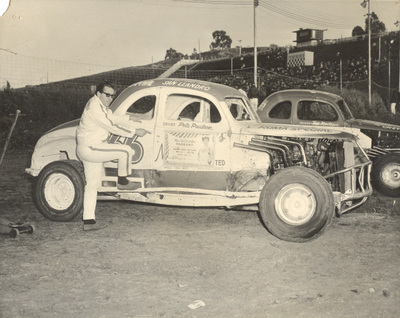 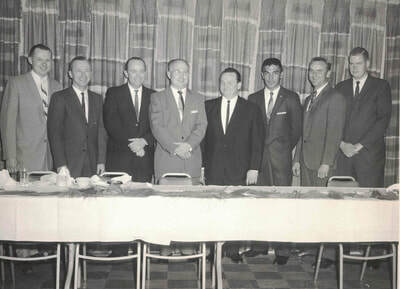 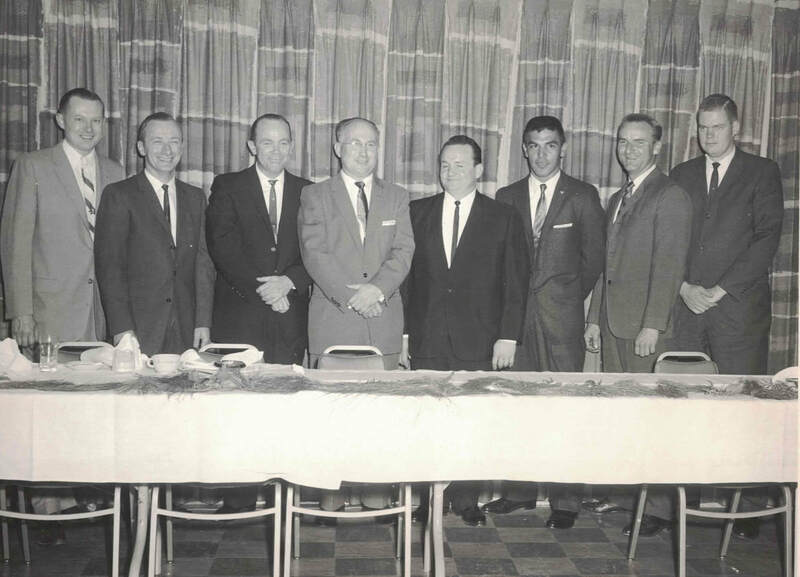 1965 Steve Mentch owner/driver in the center with Nick Annas, to his left, Nick Annas Pic. 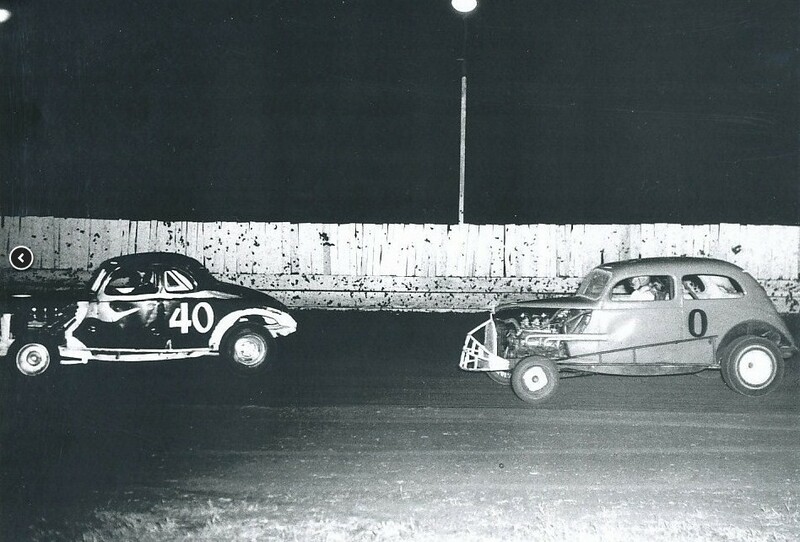 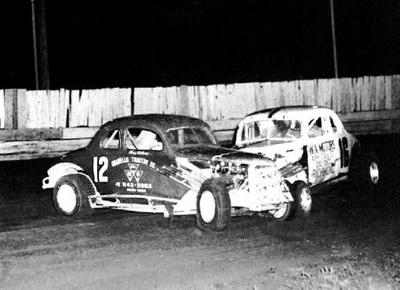 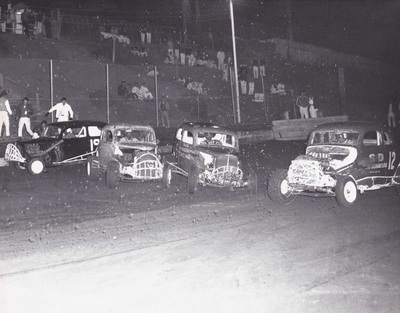 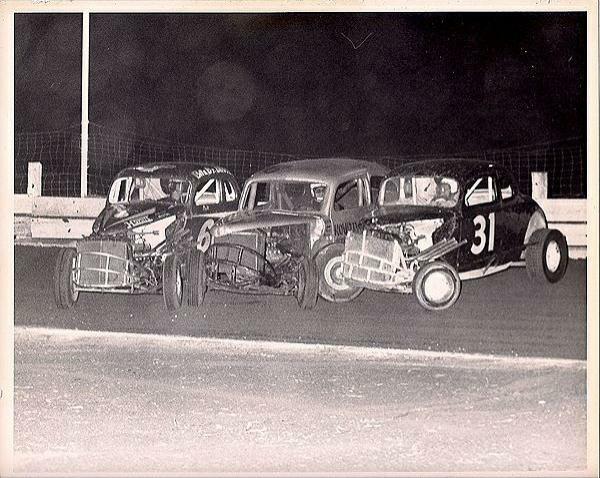 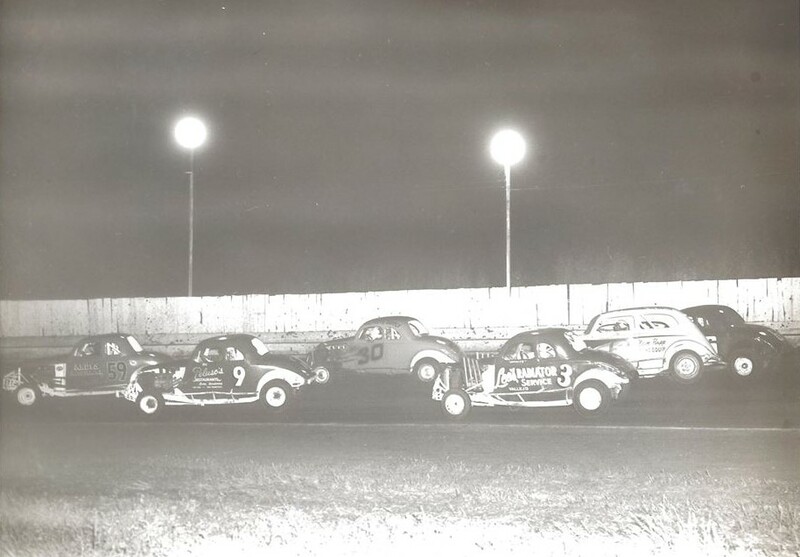 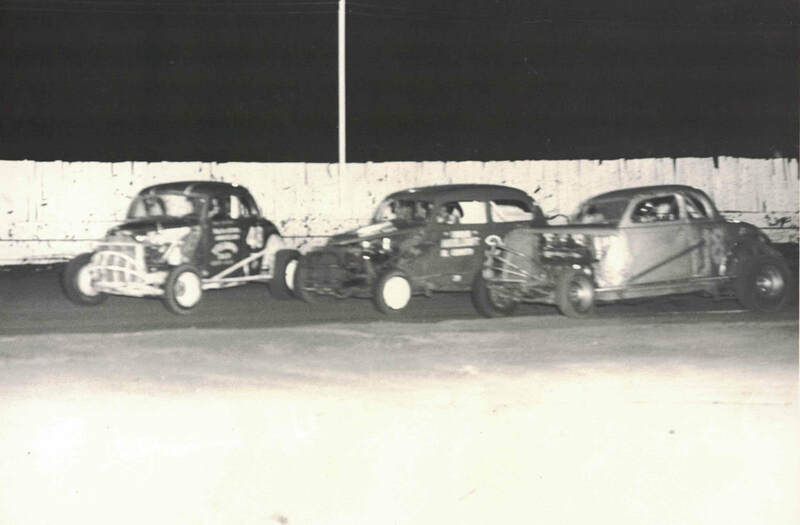 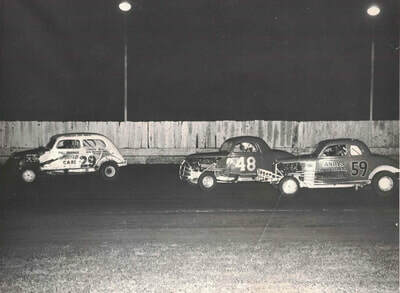 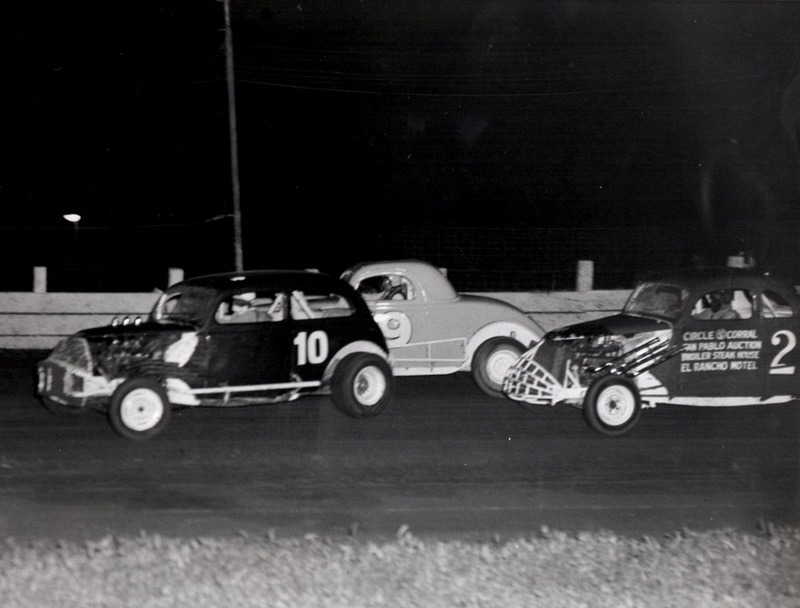 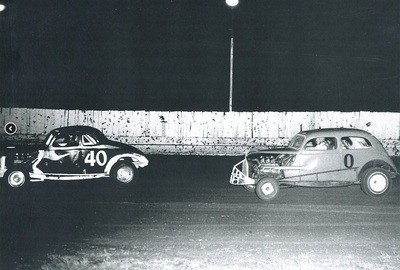 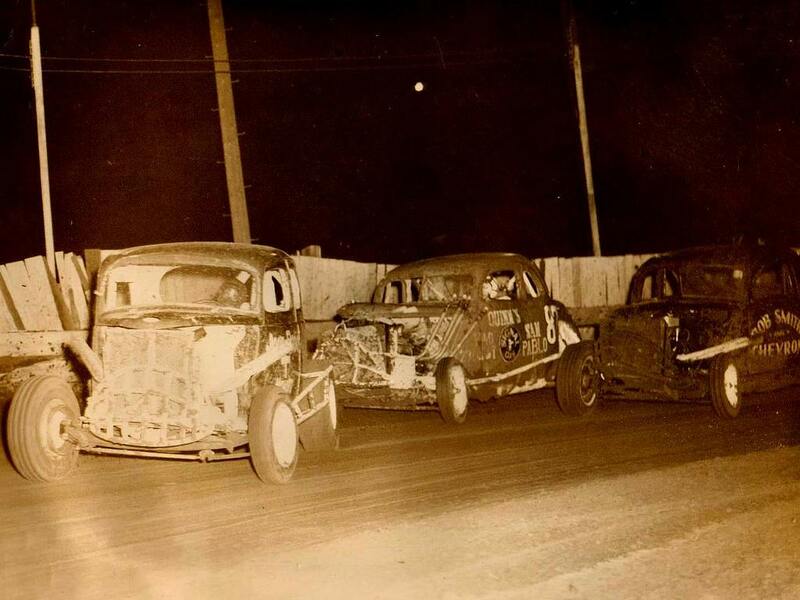 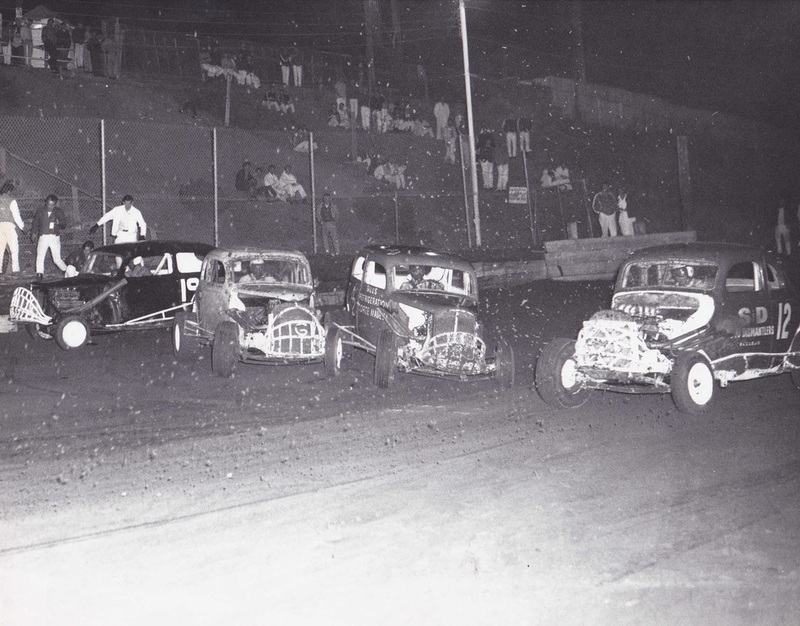 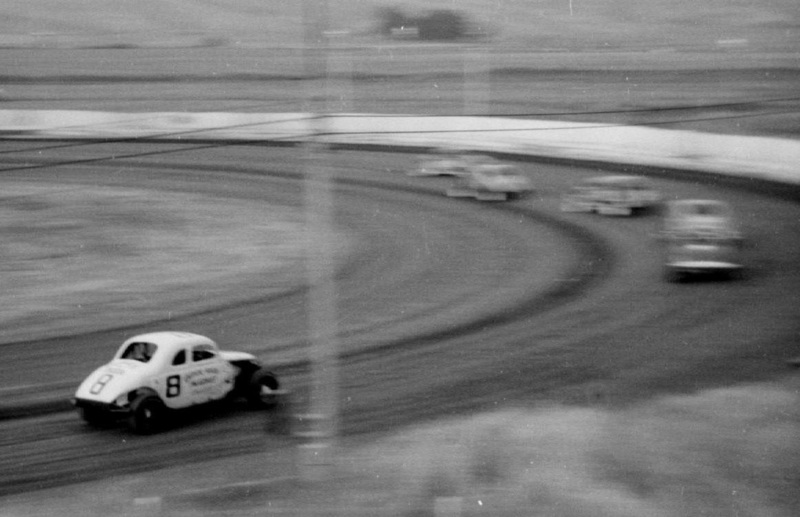 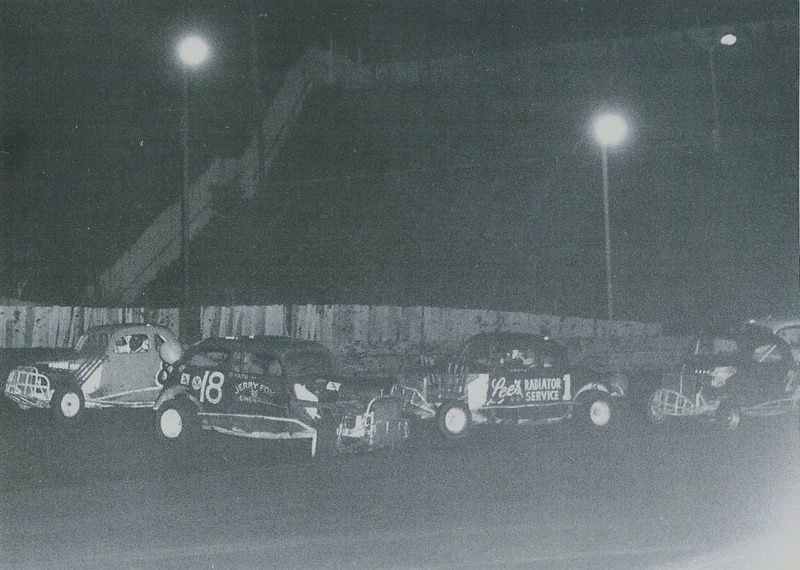 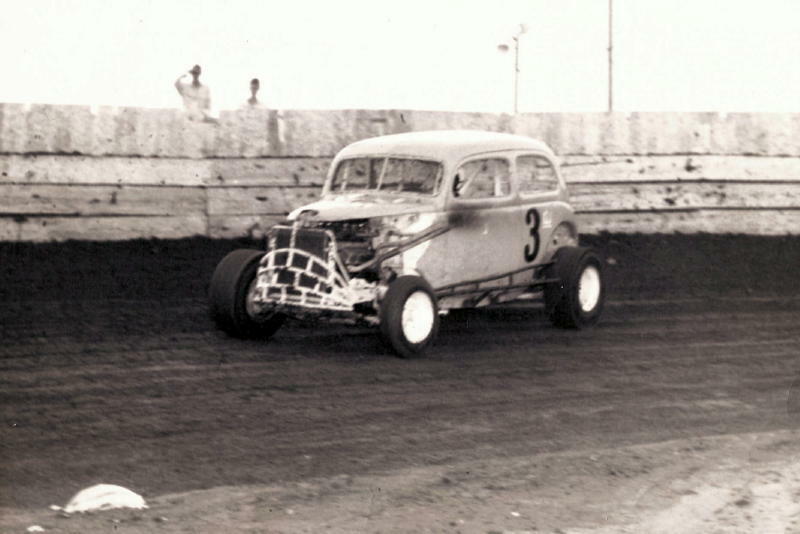 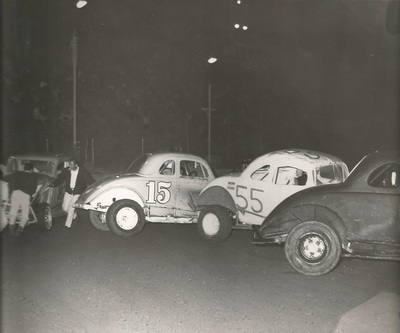 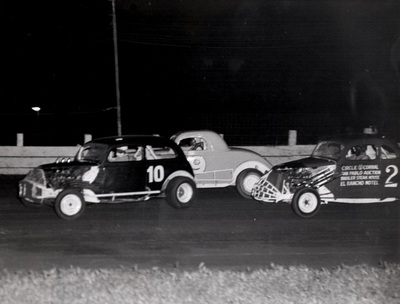 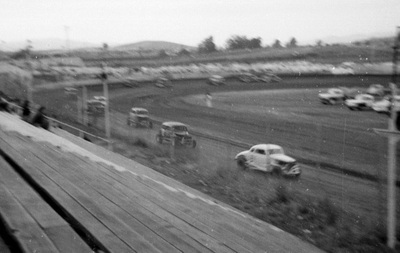 1965 Gil Richardson under #4 Leroy Geving followed by #3 Larry Damitz. 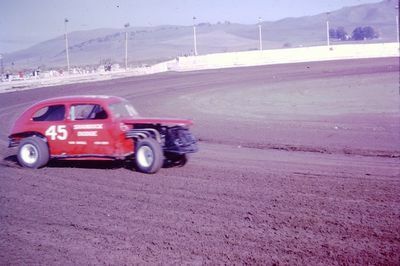 Skip Brown pic. 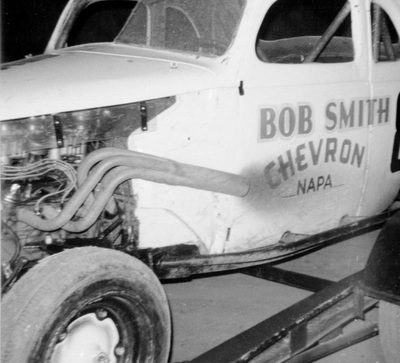 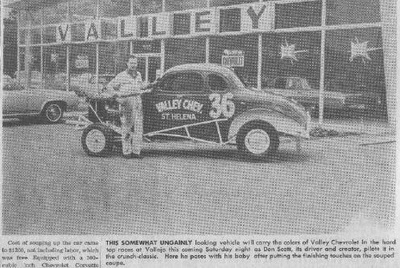 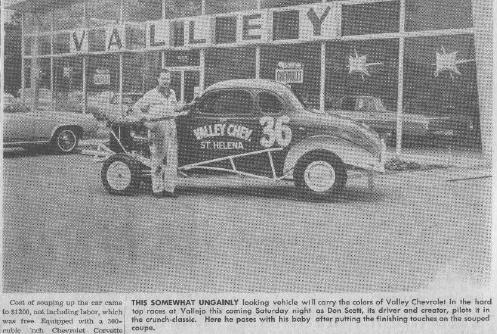 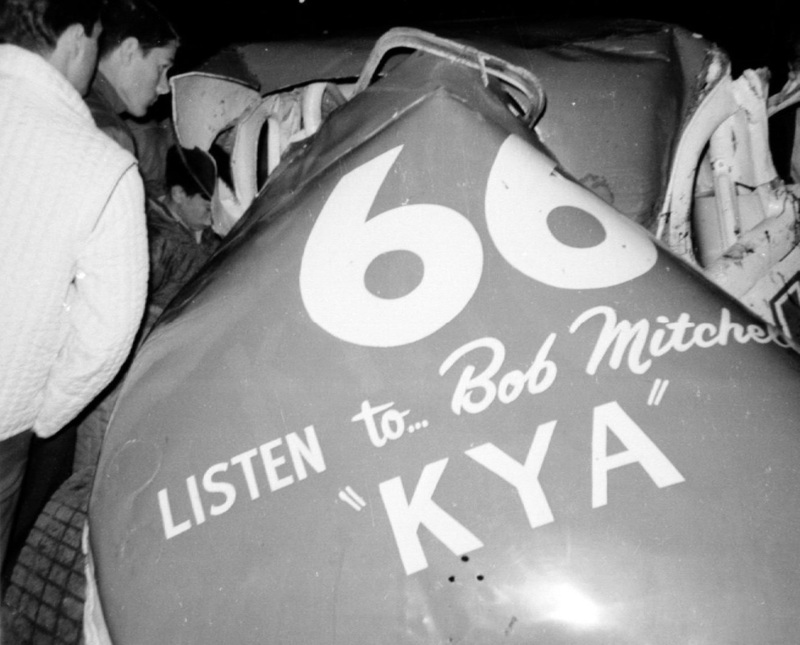 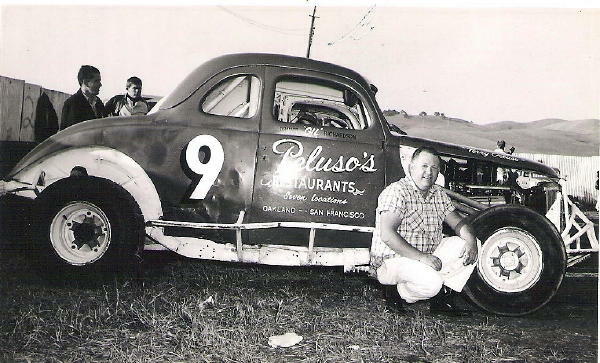 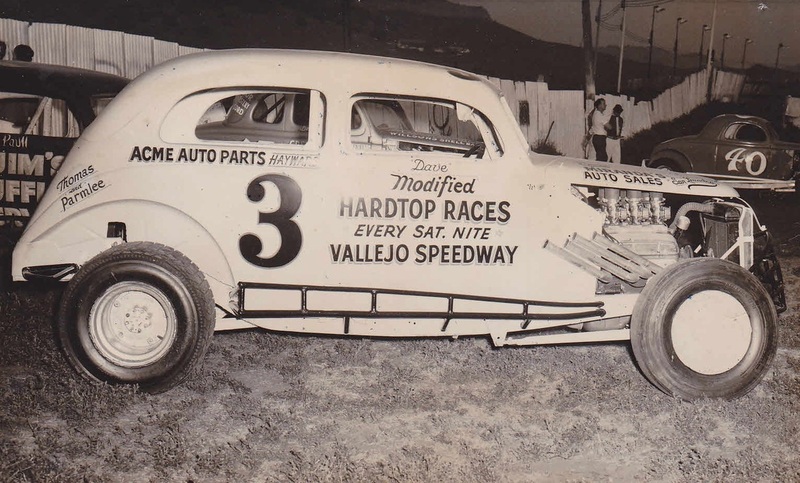 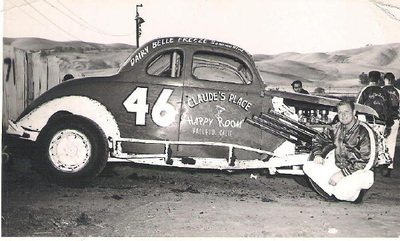 If this is 1965, it's possible Pee Wee Waybright took over this car after Phil Pedlar was suspended, according to memory. Ken again earning his nickname, Ken "Fliptop" Gandy. 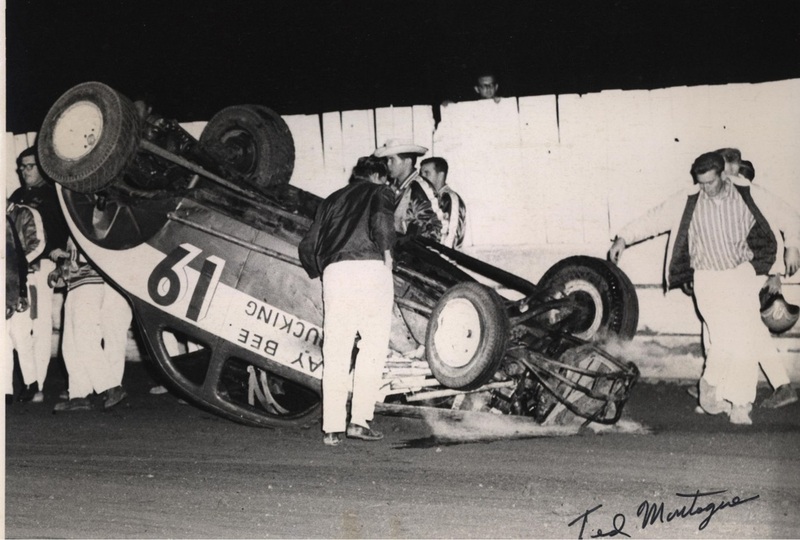 That's Jack Thompson trying to avoid further damage. 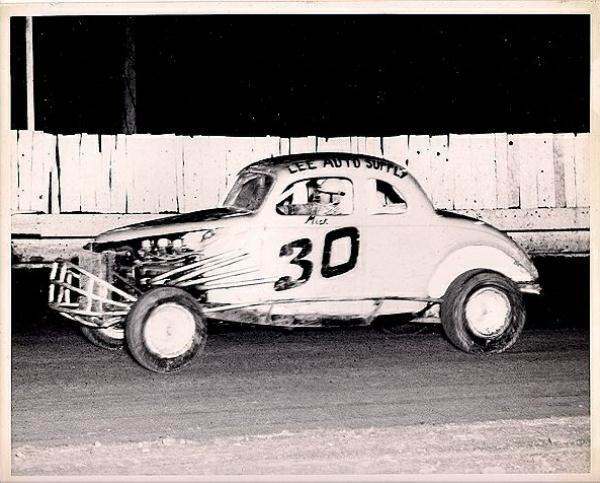 Early 1965 Ken Gandy in the well used up three window coupe. 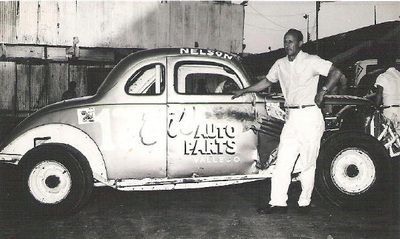 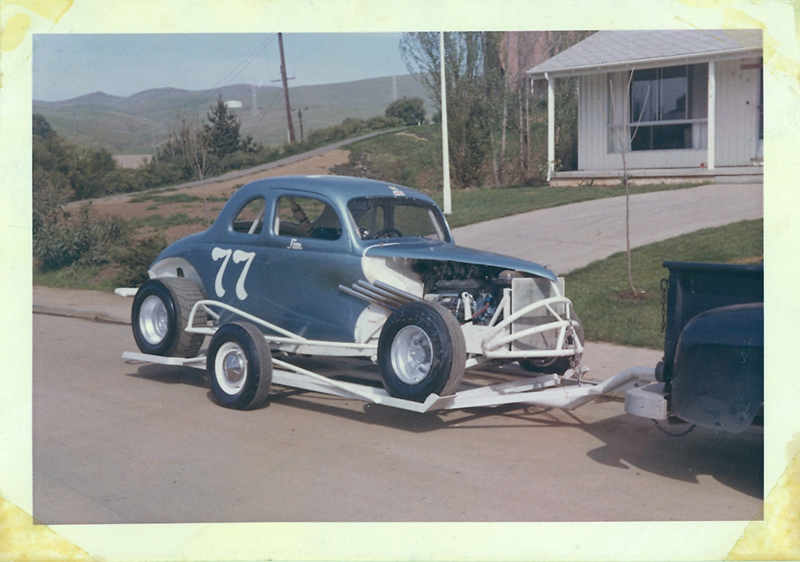 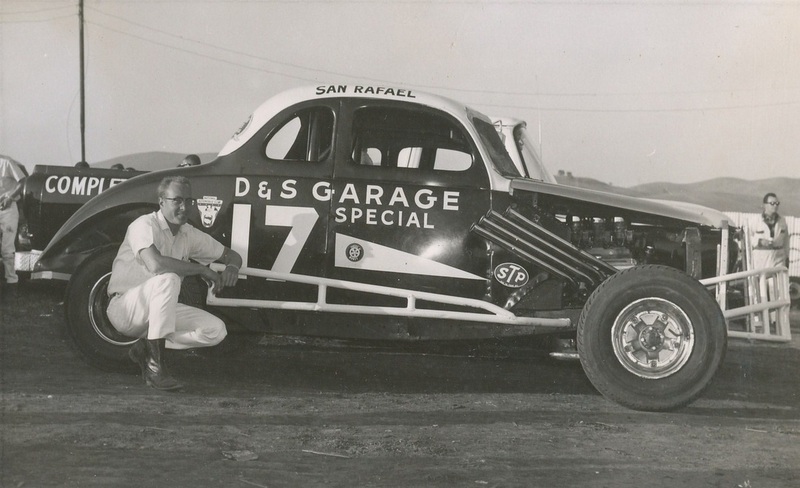 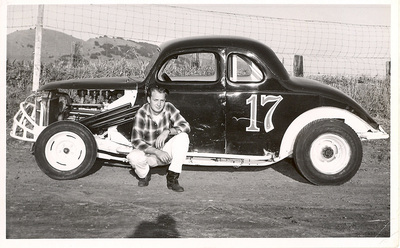 1965 #17 Nelson Snow after Kaiser sold the car to Nelson. 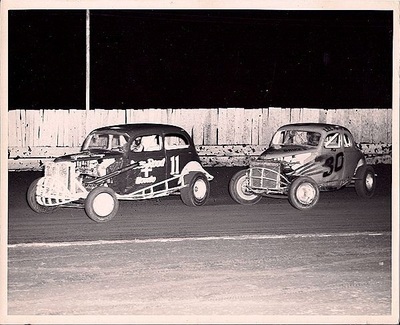 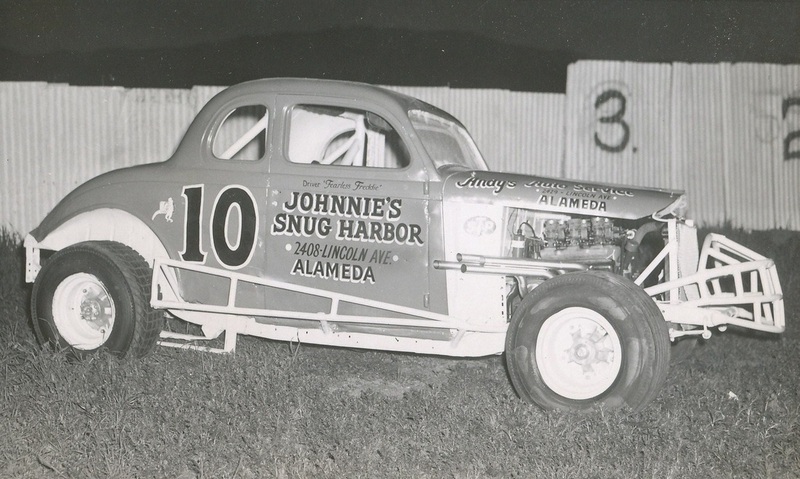 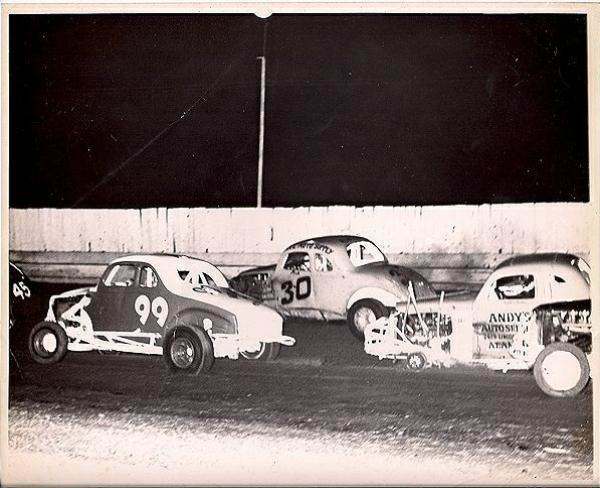 1965 #19 Left to right: Driver Ted Montague, Owners Nick Annas and Steve Davis, Steve Hogin. . Nick Annas Pic. 1965 #45 70 Lonnie Kaiser, Jim Curren, preseason. William Smith pic. 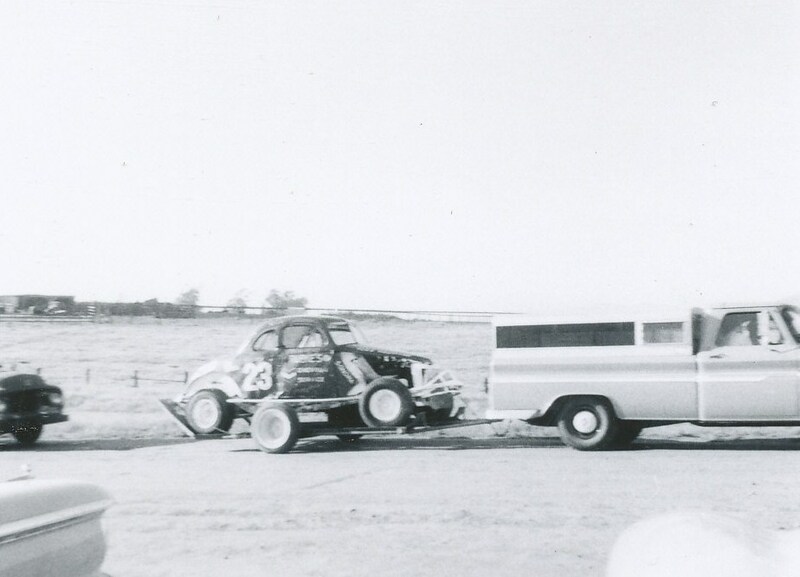 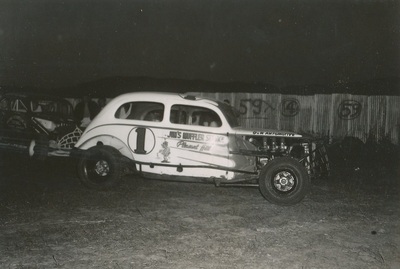 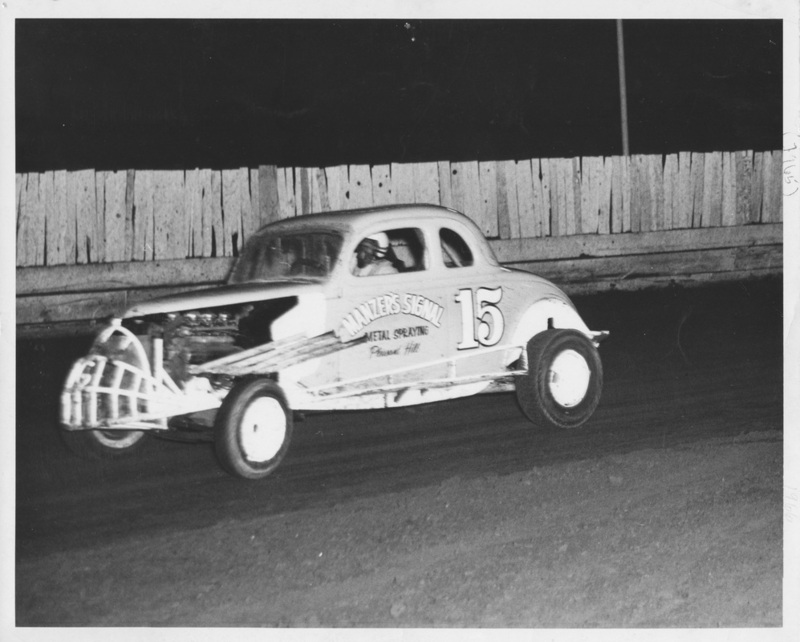 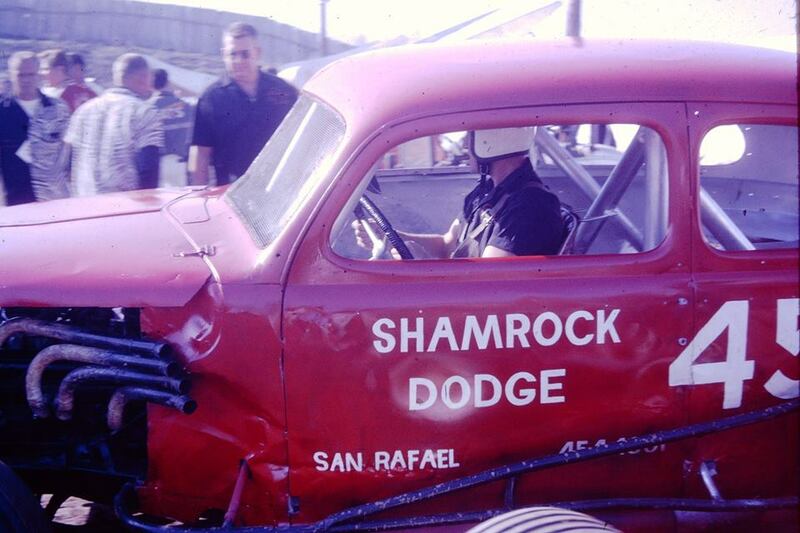 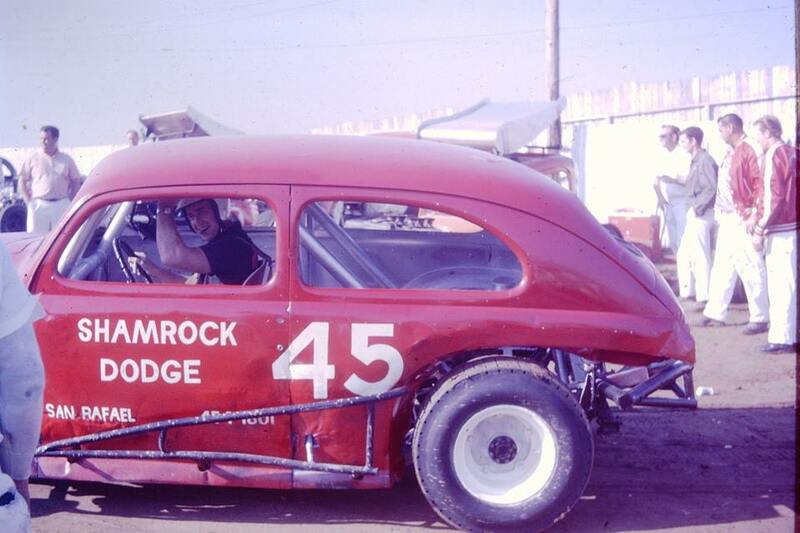 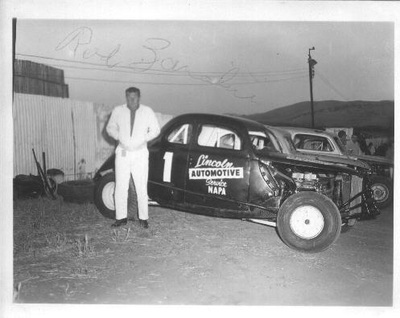 Mick gets a new ride late in 1965 driving for Bob Percell. 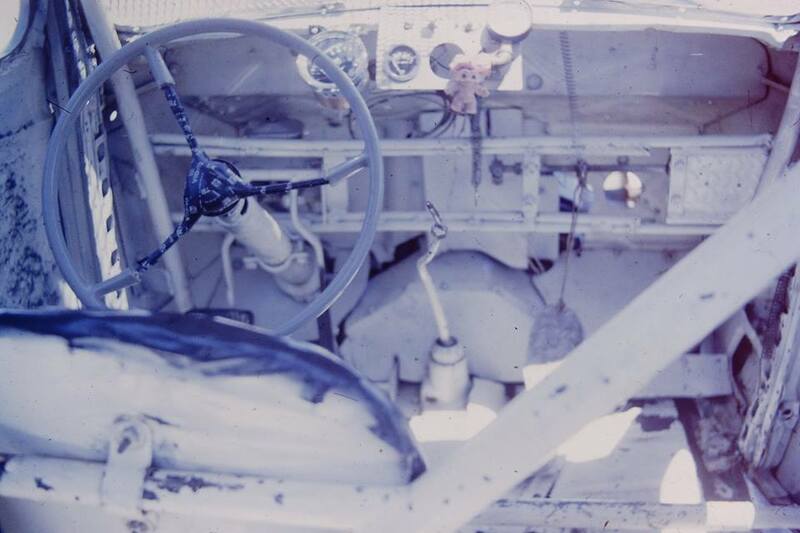 1965 Pete Paulsen needs a new paint job. Somebody tried opening the rumble seat. 1965 #0 Wally Kindt, 88 Jack Thompson, 17 Jim Kaiser, 45 Paul Stornetta. 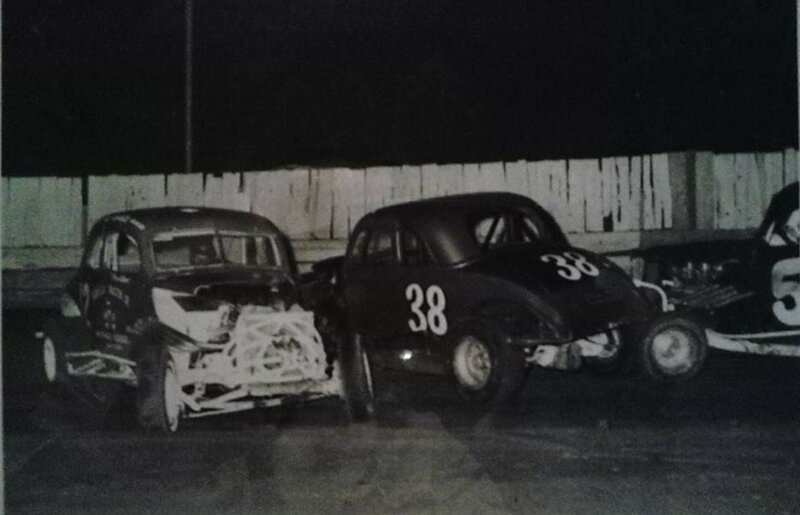 #99 Bill Hammond, #30 Mick McGregor. 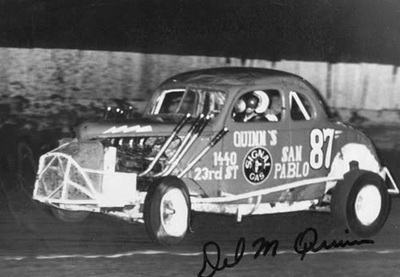 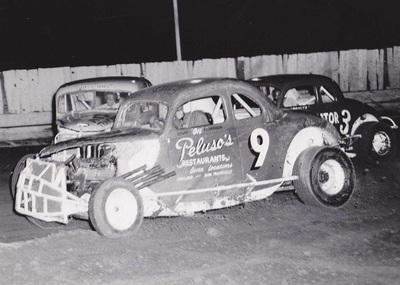 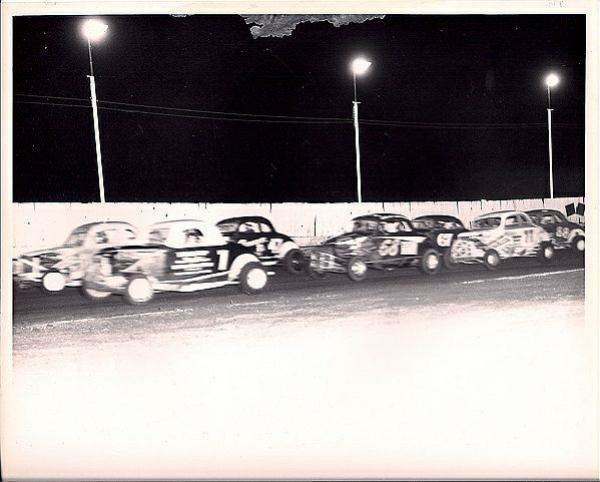 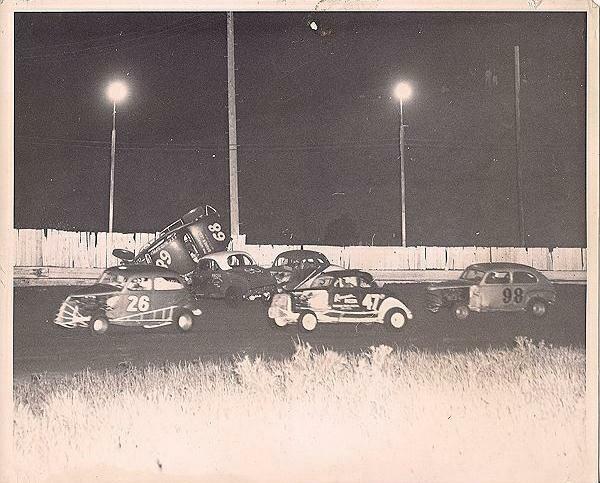 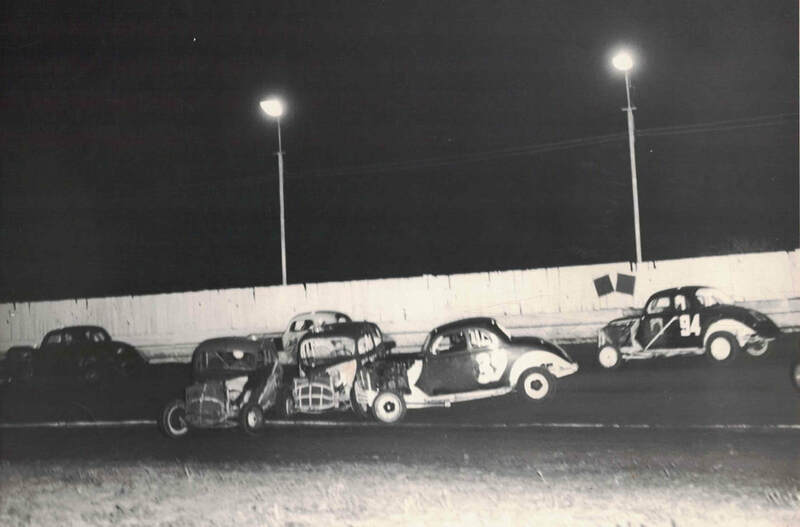 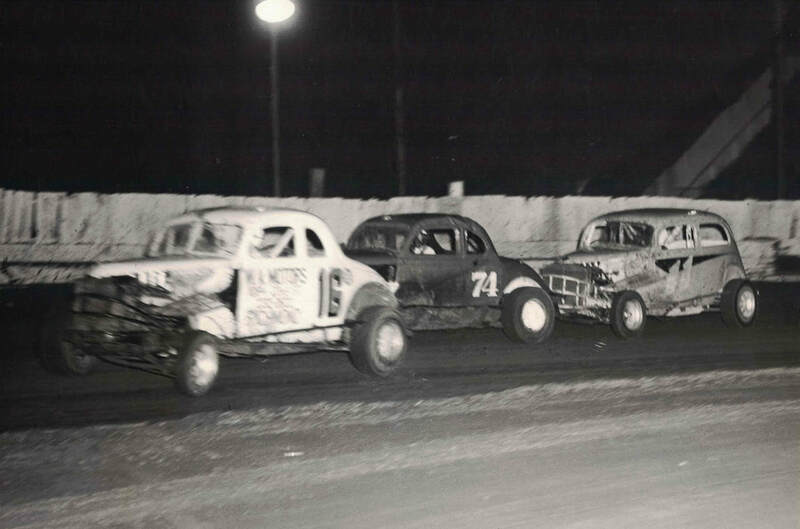 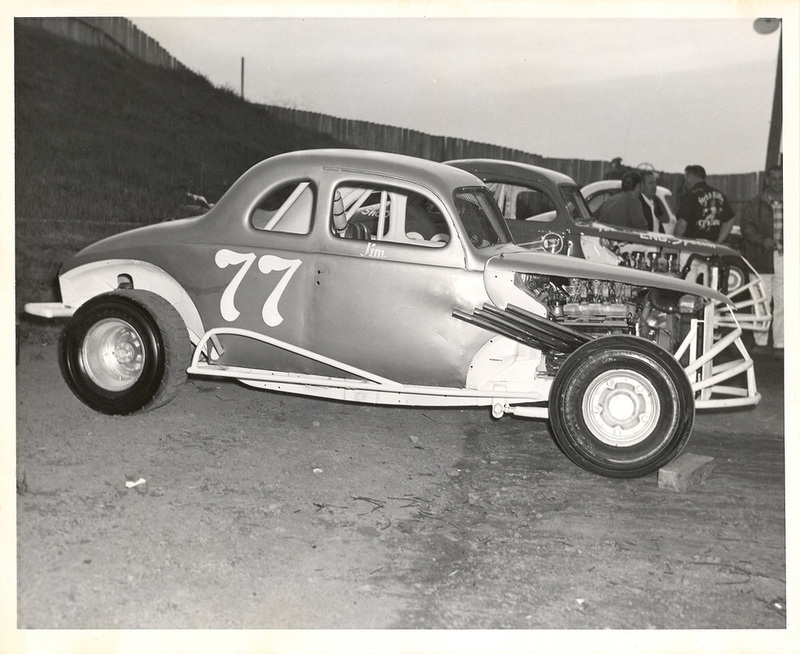 1965 11 Phil Pedlar or Pee Wee Waybright, 87 Del Quinn, 6 Leroy Geving, but looks like Powder Puff as isn't that a girl in Pedlar's car? 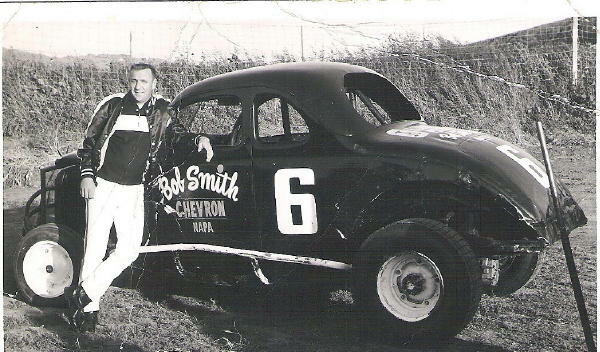 ..Jack Snell pic. 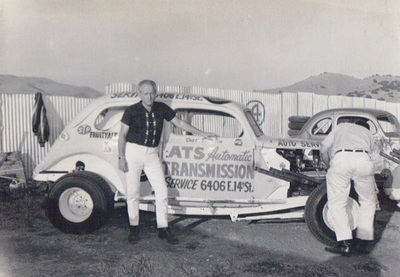 1966 Dave Logan on the left and car owners Bob Thomas on the right and Ed Parmlee in the center. Skip Brown pic. 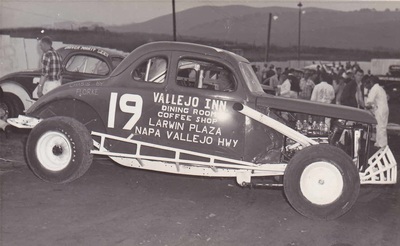 1966 Dave Logan championship ride. Skip Brown pic. 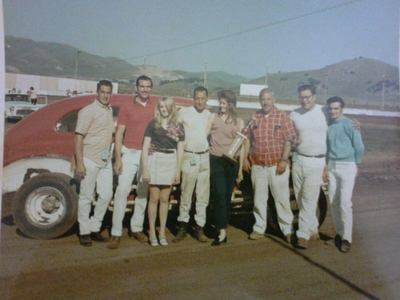 1966 Looks like Rod Zanoline on the left. 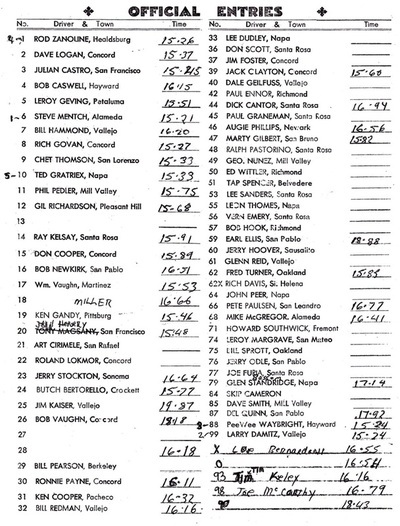 #6? Skip Brown pic. 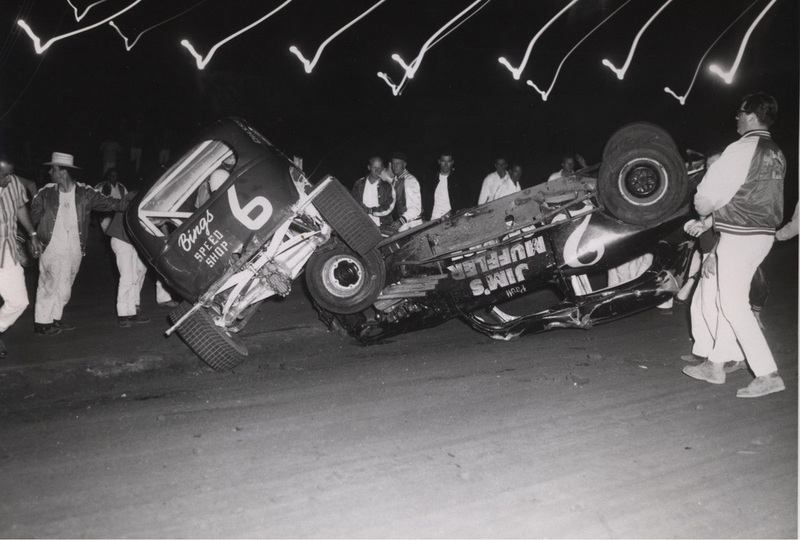 1966 Leroy Geving's ride with Ken Gandy checking for tricks. 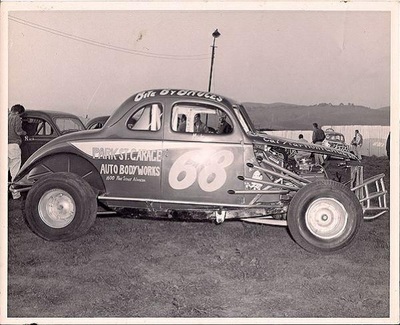 1966 Paul Stornetta. 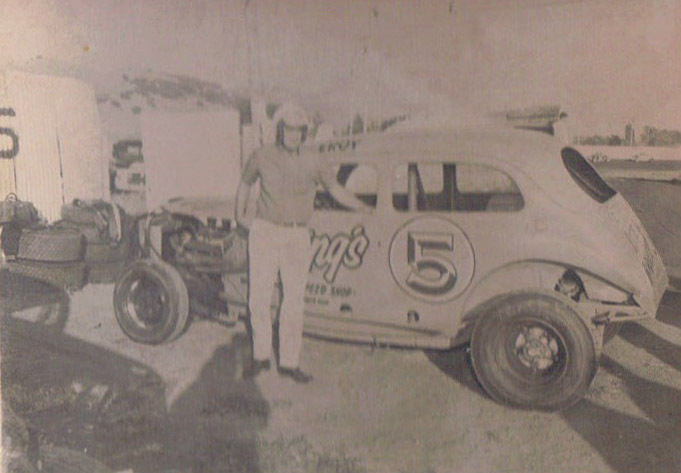 Skip Brown pic. 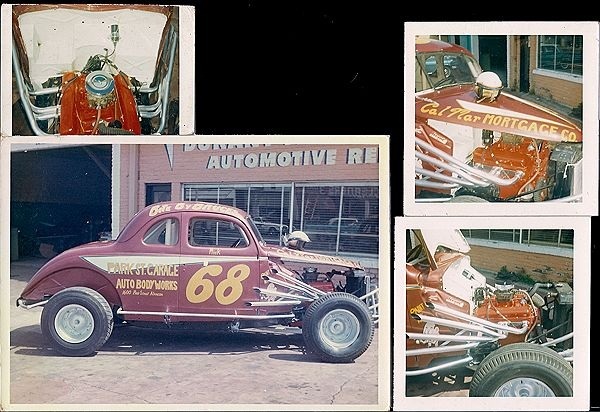 1966 Marty Gilbert. Skip Brown pic. 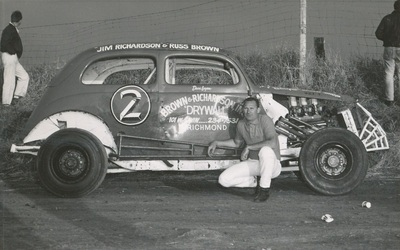 1966 Gil Richardson. 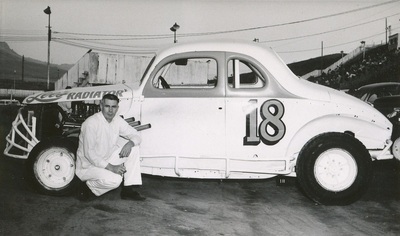 Skip Brown pic. 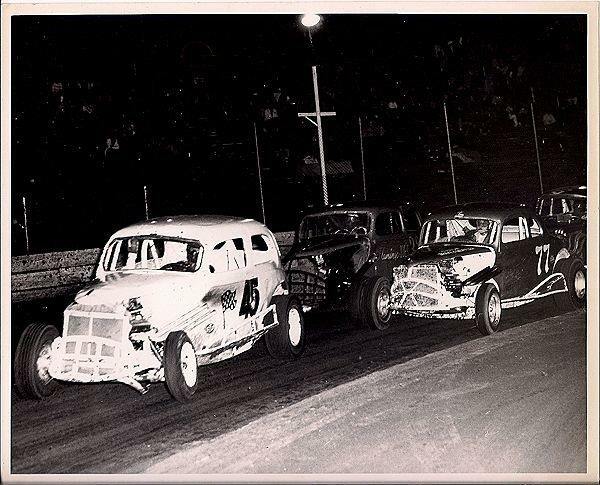 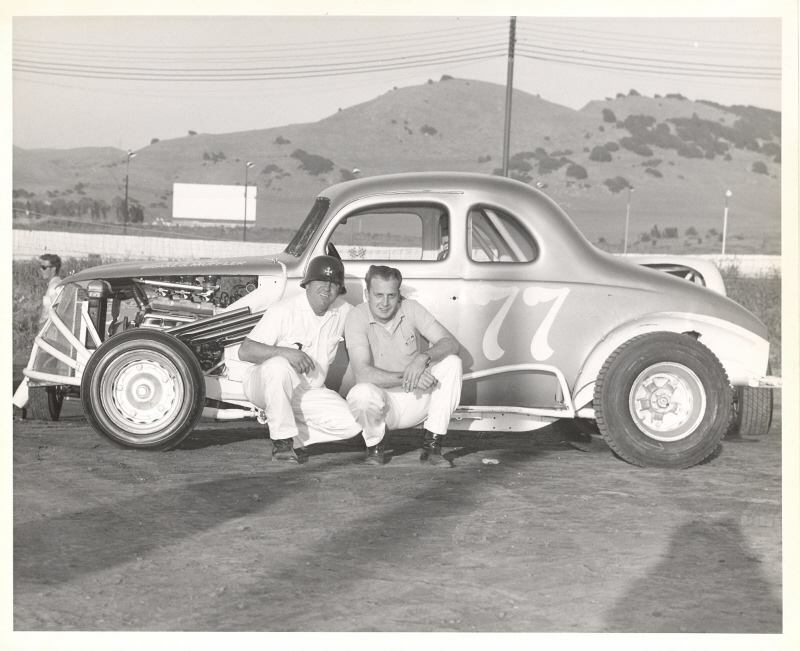 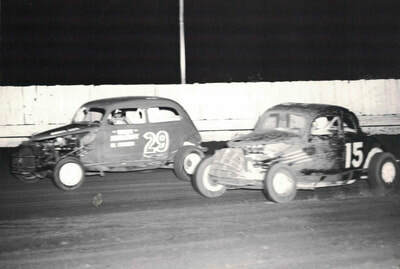 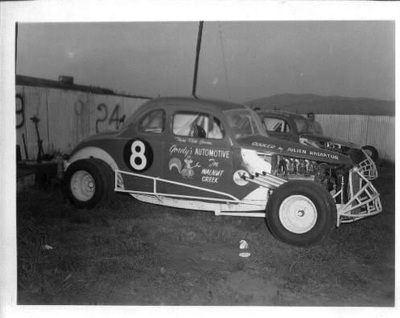 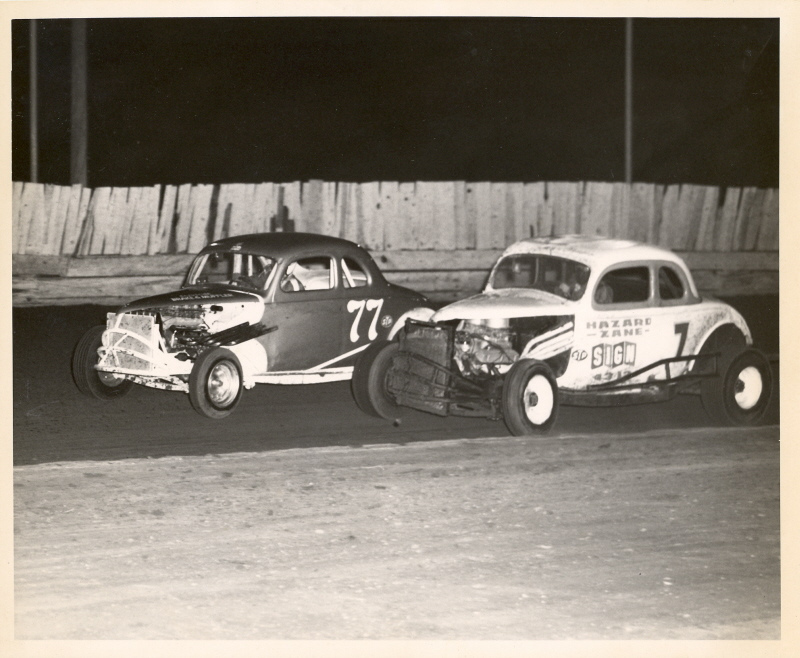 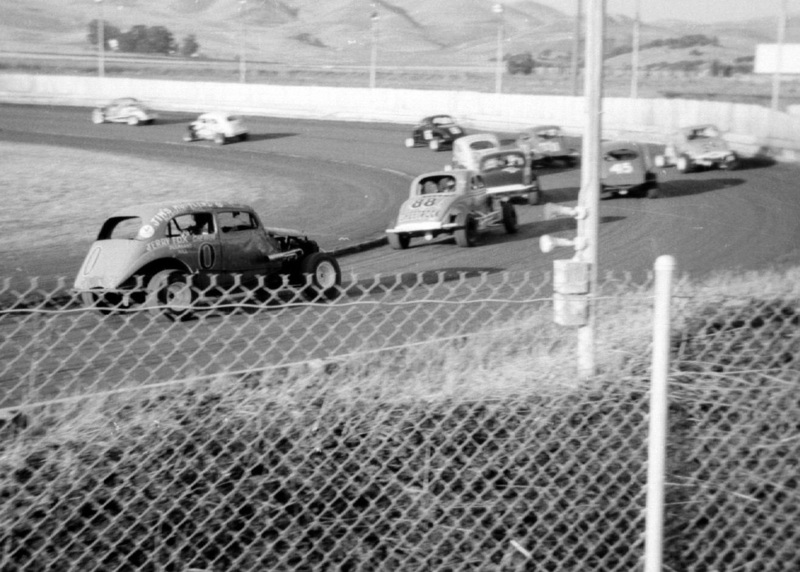 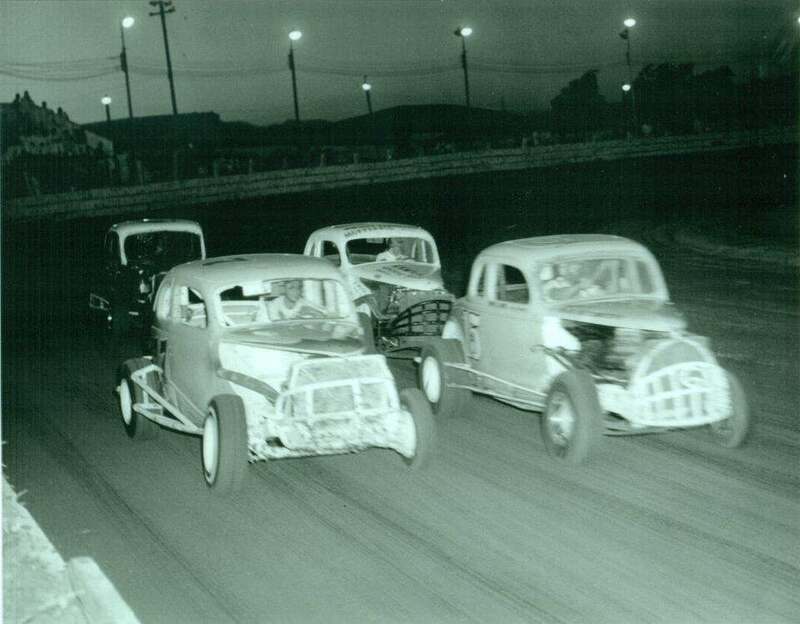 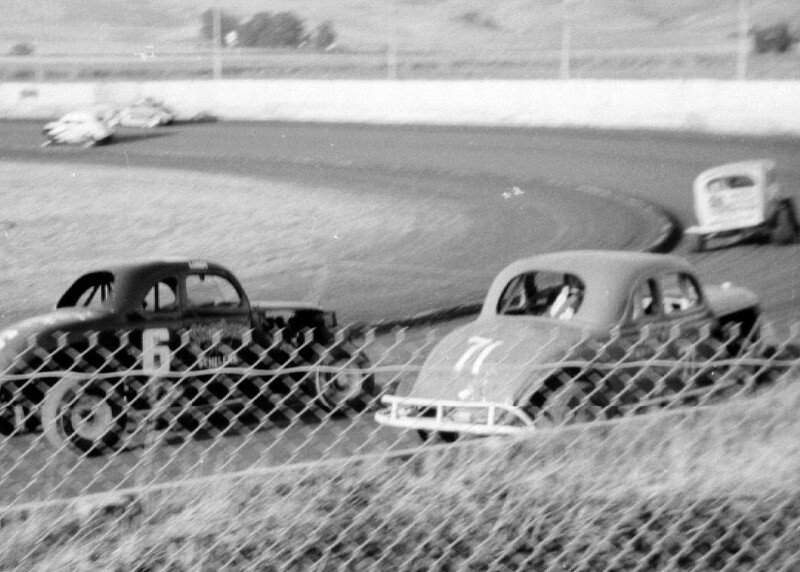 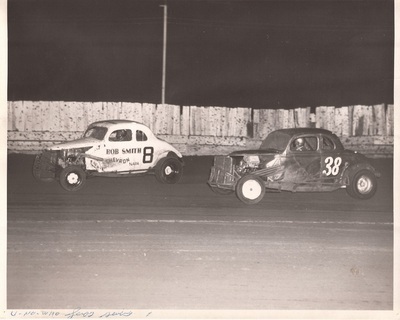 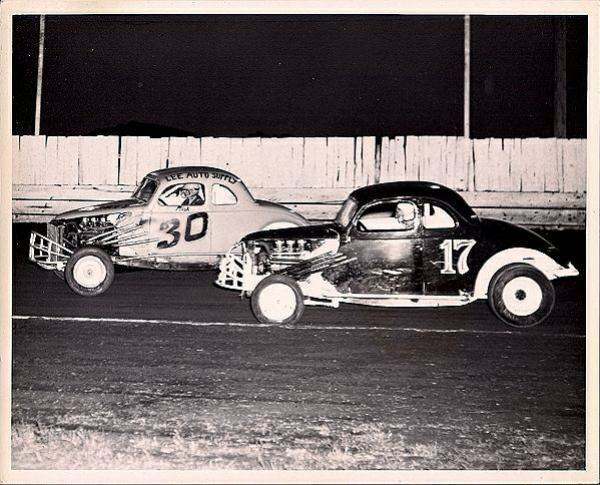 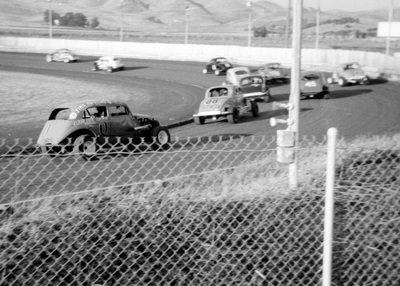 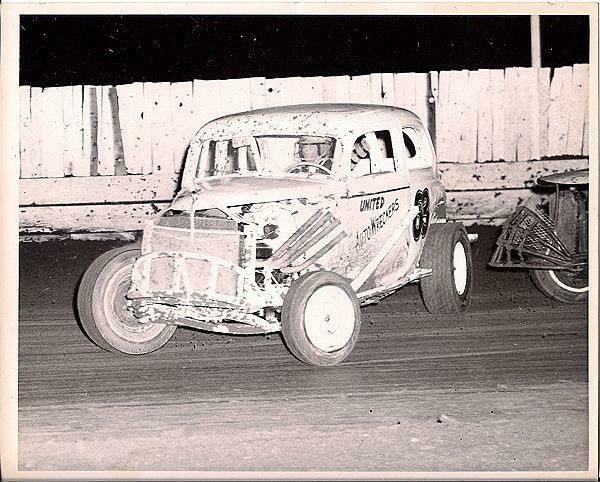 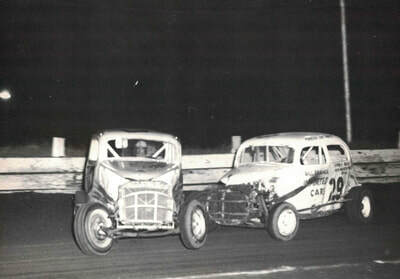 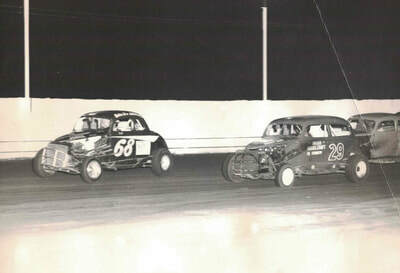 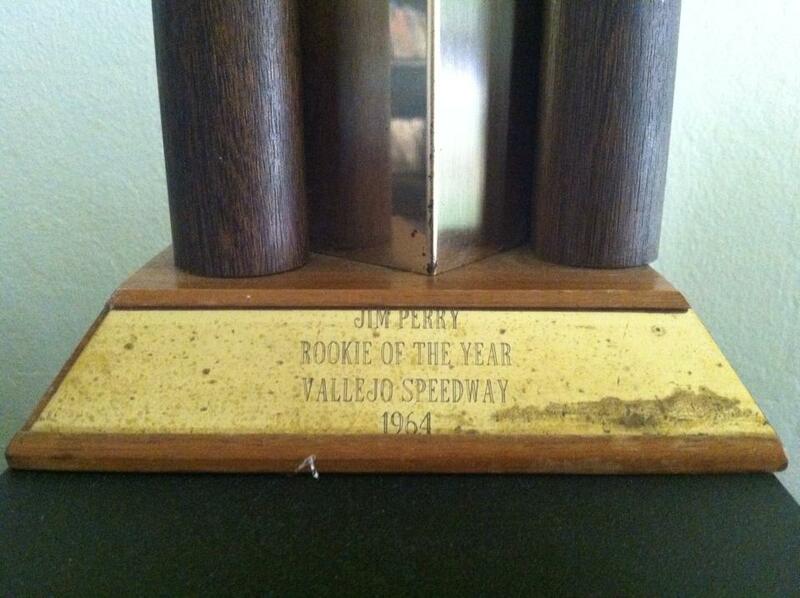 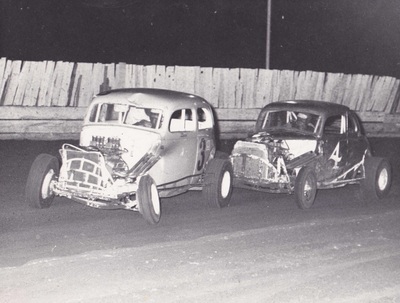 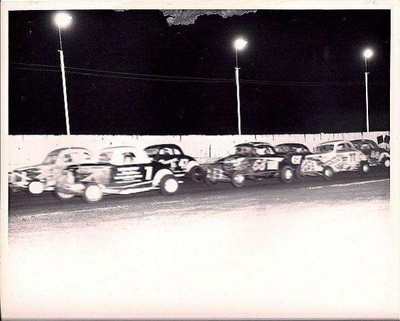 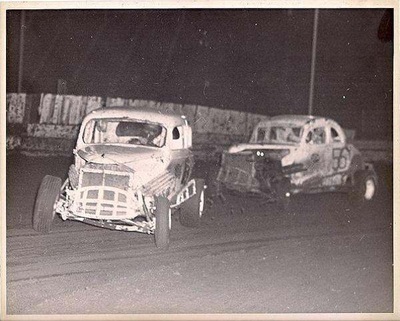 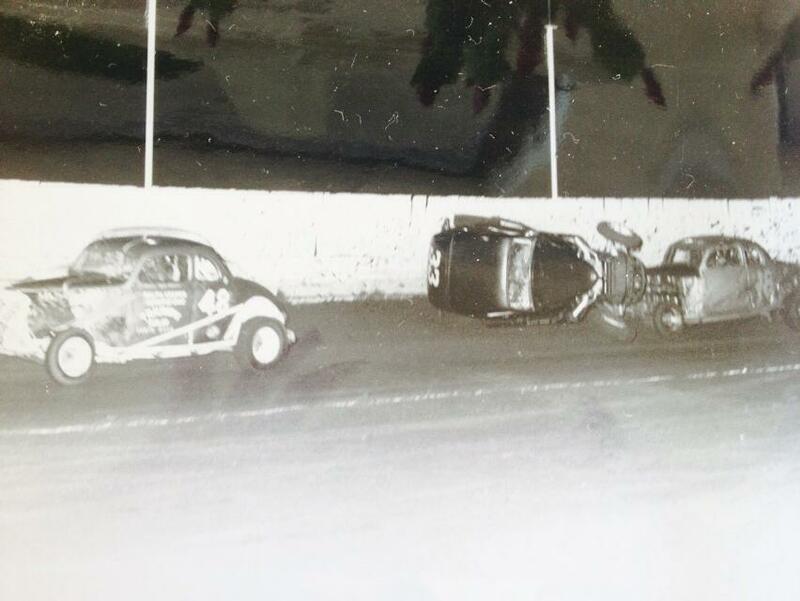 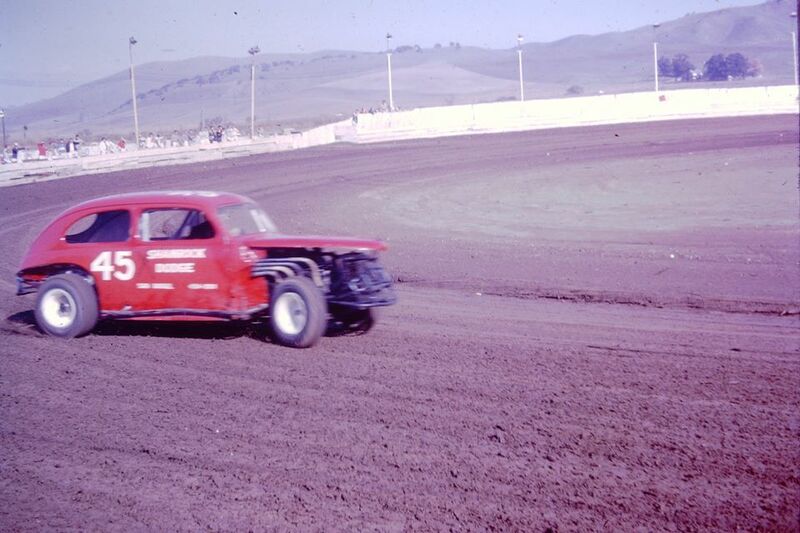 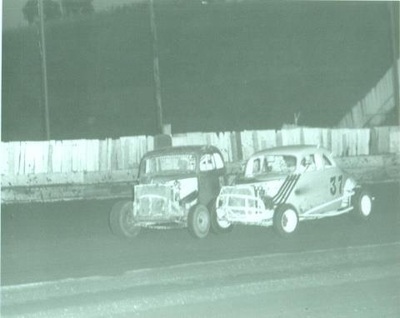 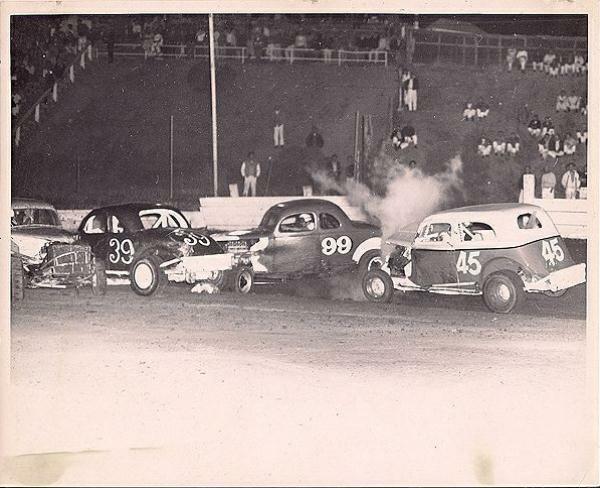 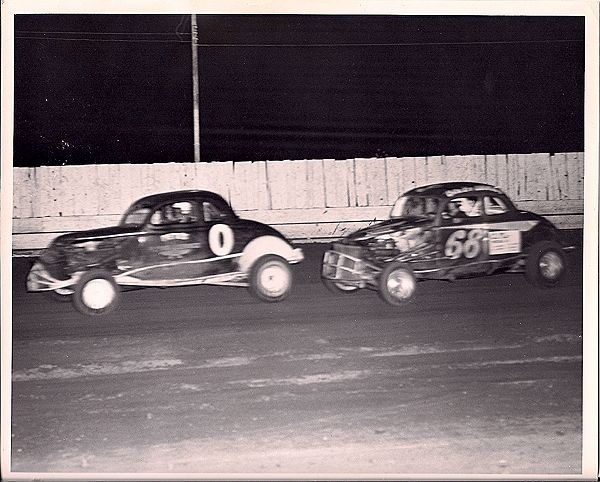 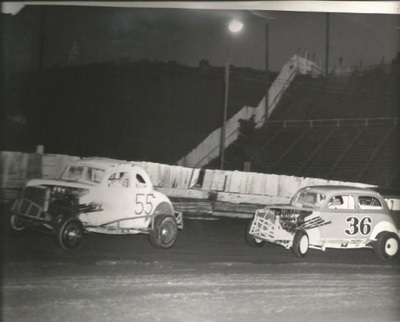 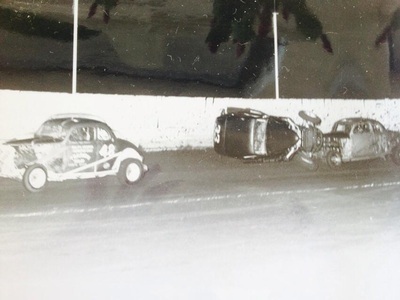 1966 My uncle Earl Perry Jr #37 and my dad Jim Perry Sr #80 racing together at Vallejo Speedway. 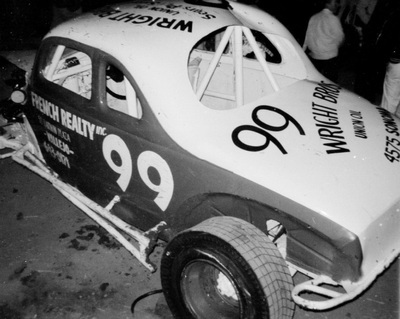 The #80 car is on the VRA decal. Maria Ferriera pic. 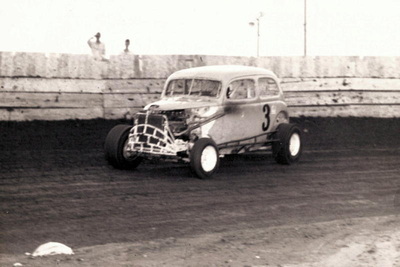 Dave Logan in the #3. 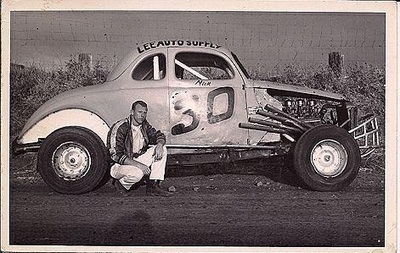 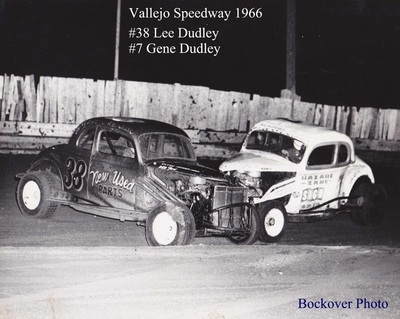 1966 #38 Lee Dudley. 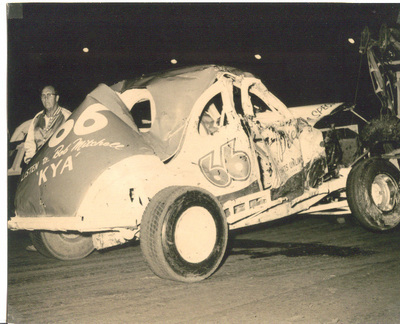 Skip Brown pic. 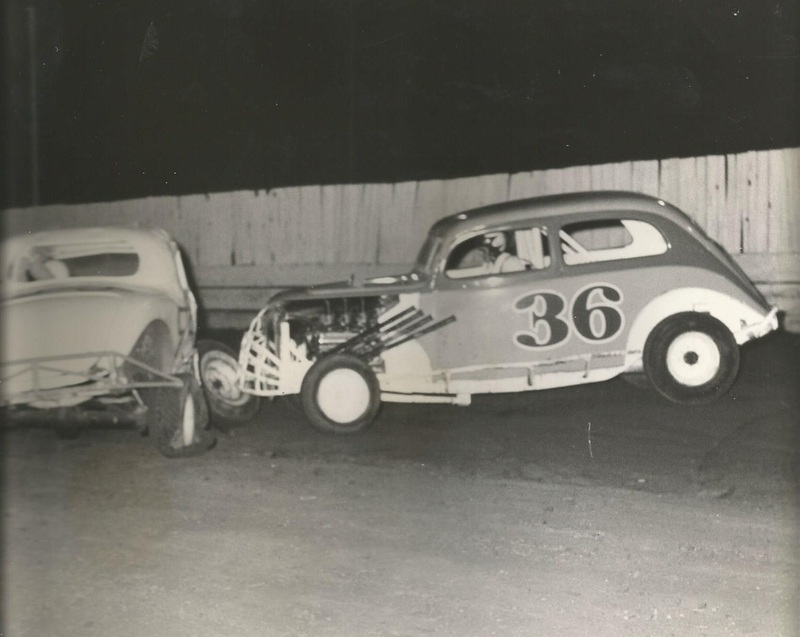 1966 Leroy Geving and #38 Lee Dudley...Keith Chiles pic. 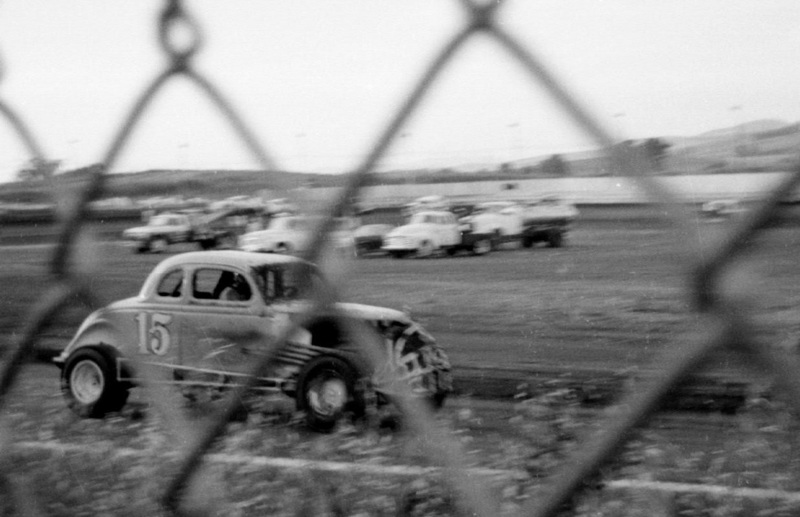 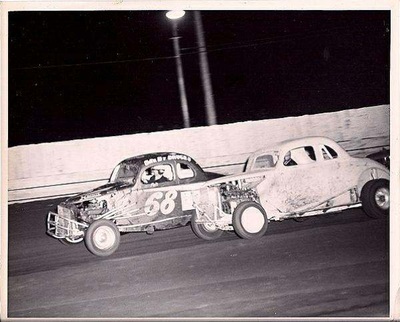 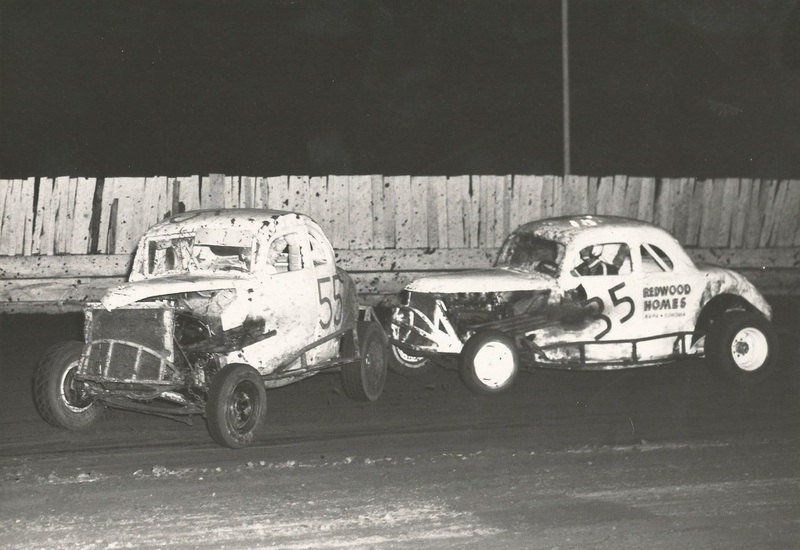 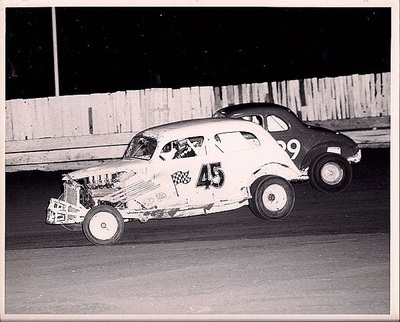 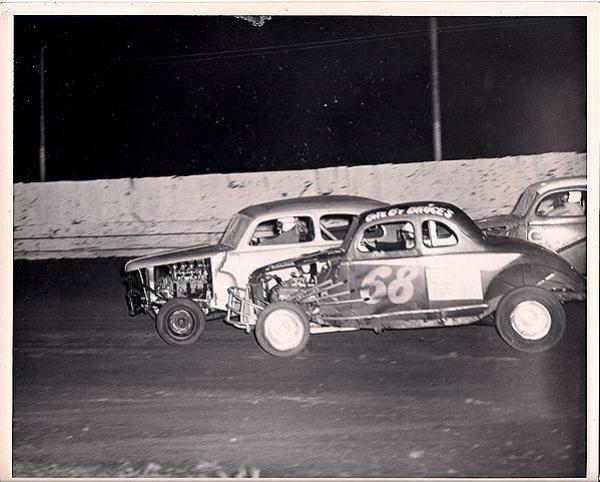 Mick McGregor leading Bob Hansen if #56 or Dave Bayles if #55. 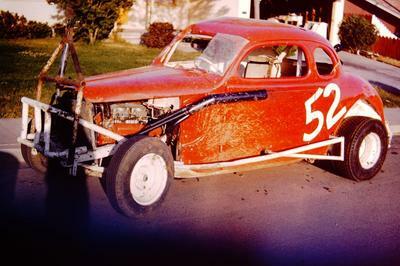 It looks very much like the 55 in the next photos. 1966 Here is Fred Grzelak with my dad. 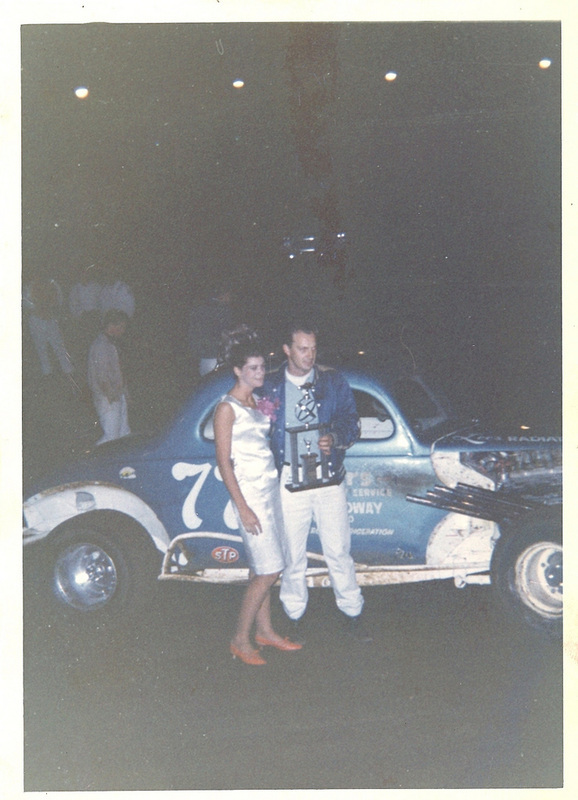 I don't know where he got the German helmet..Jim Kaiser Jr.
1966 Jim Kaiser trophy win. 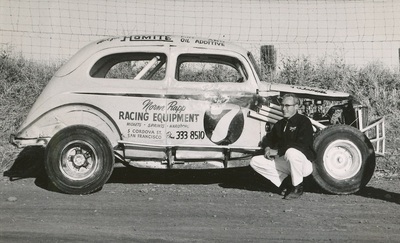 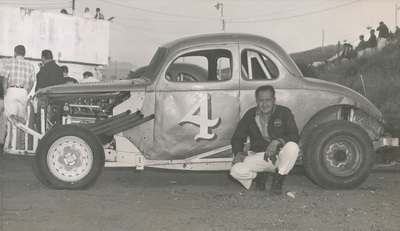 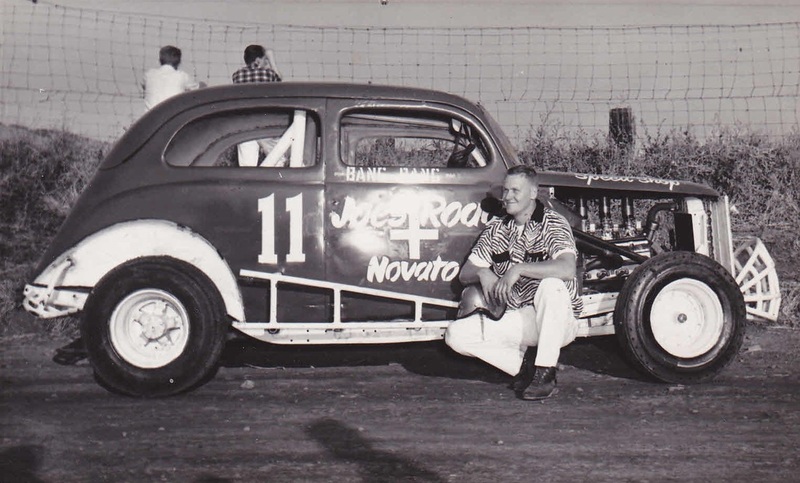 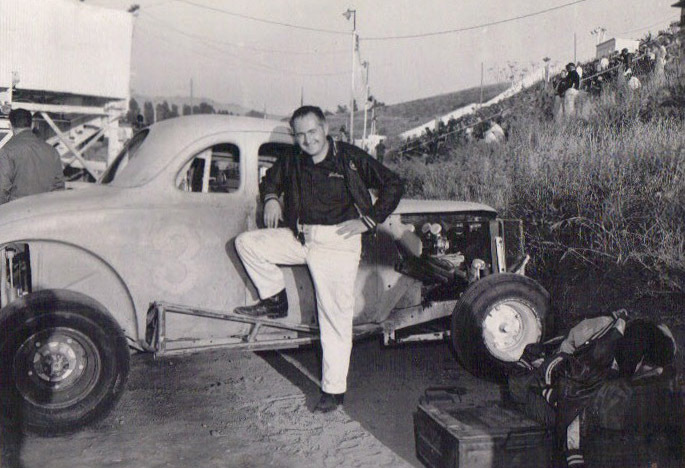 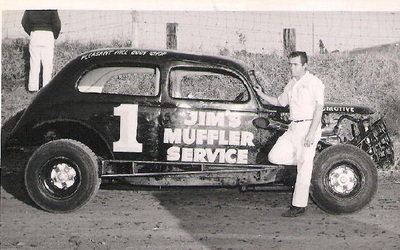 Jim Kaiser Jr. pic. 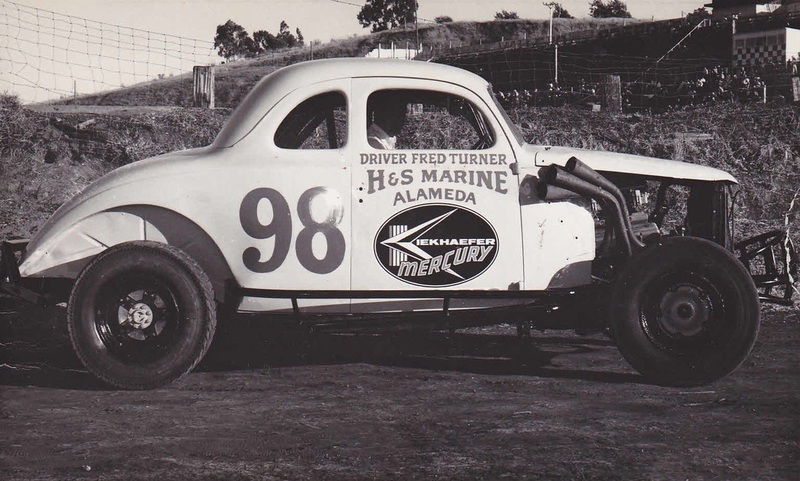 1966 Fred Turner. 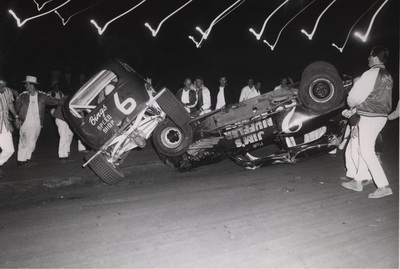 Skip Brown pic. 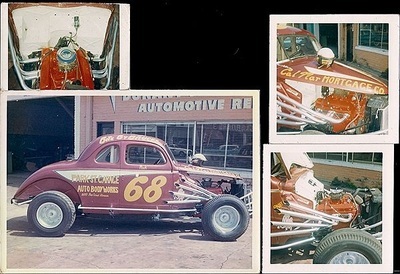 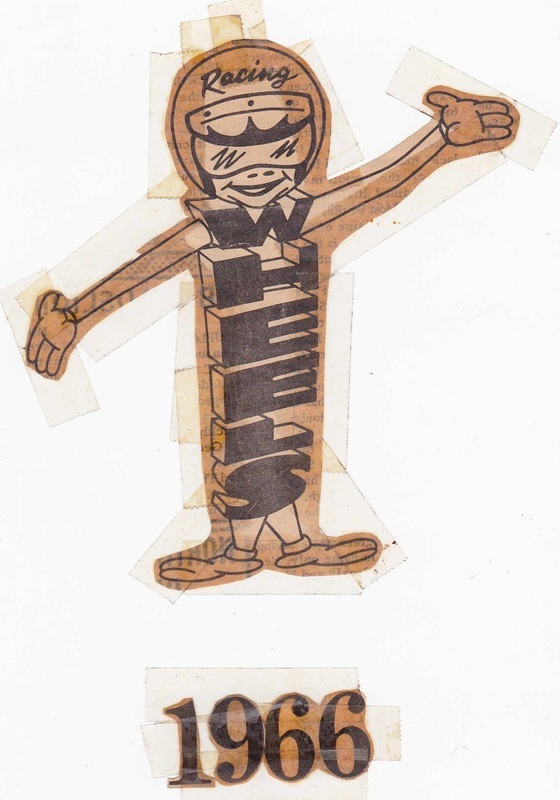 Racing Wheels Magazine Logo.Skip Brown pic. 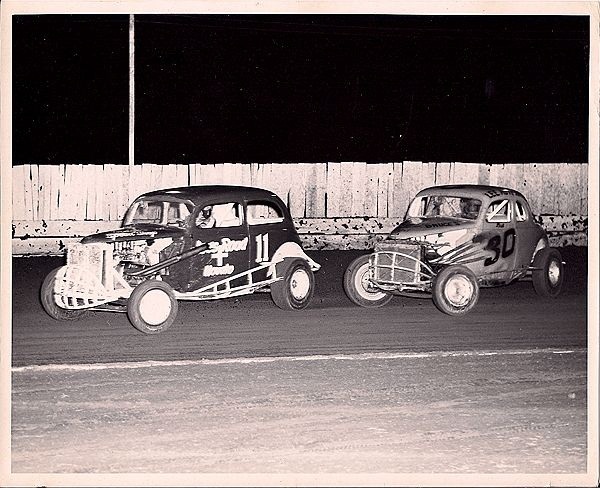 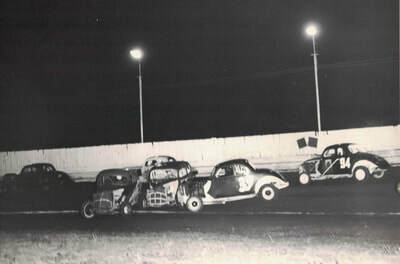 1966 #19 Paul Stornetta, 15 Ken Gandy, 42 Dave Smith, 12 Pee Wee Waybright. 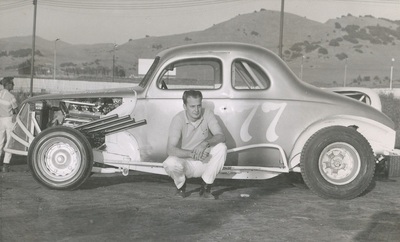 Skip Brown pic. 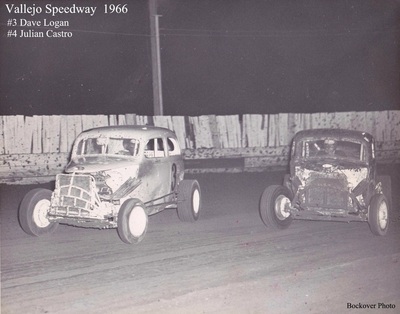 1966 #3 Dave Logan, 4 Julian Castro. 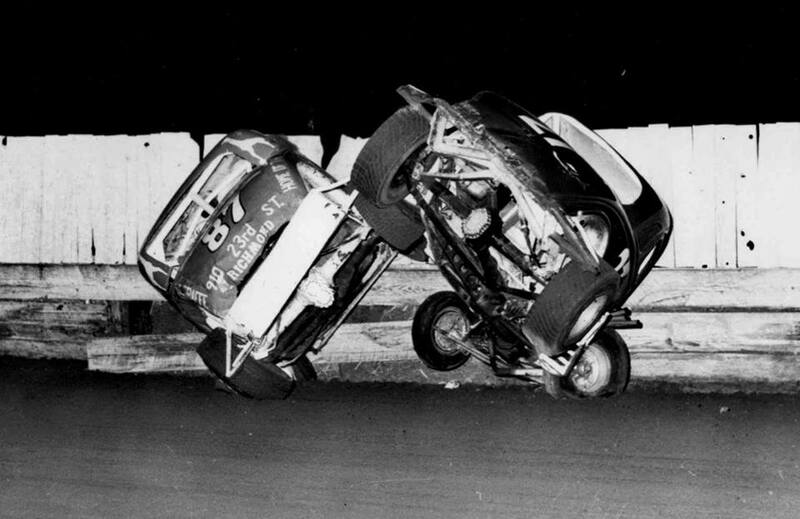 Skip Brown pic. 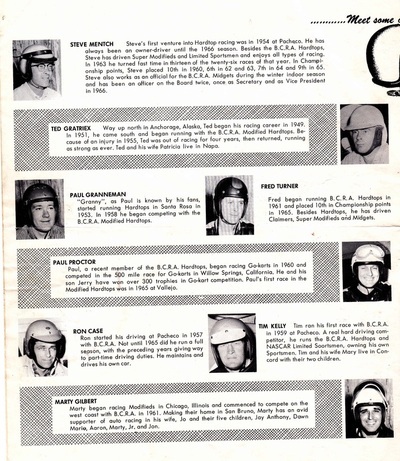 1966 Some driver history. 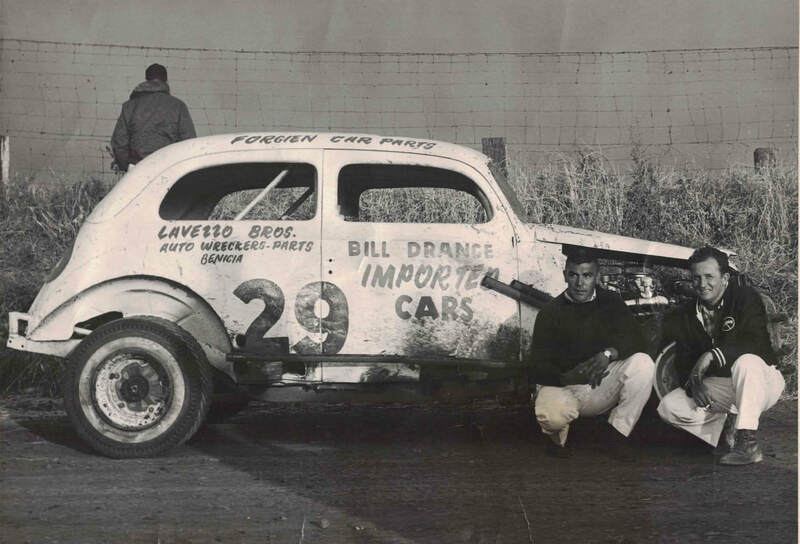 Skip Brown pic. 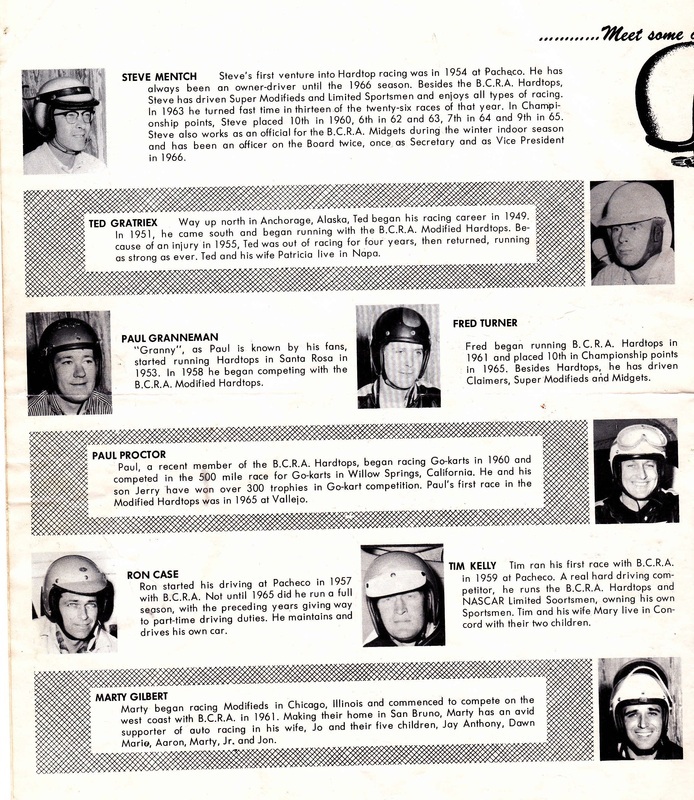 1966 More driver history. 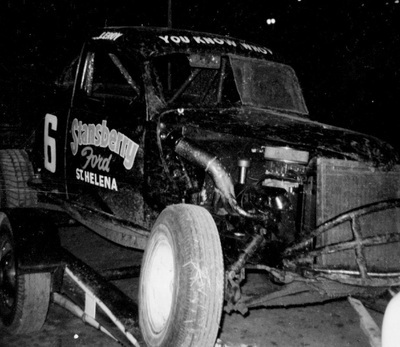 Skip Brown pic. 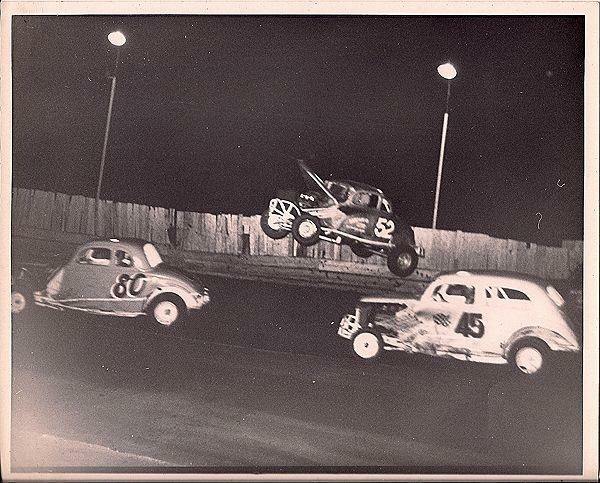 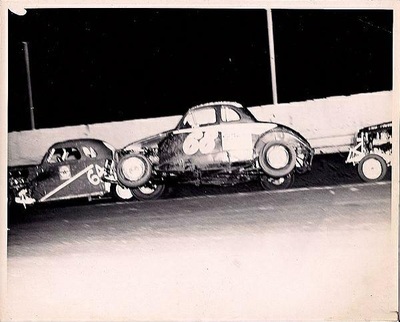 #80 Jim Perry, Mick McGregor and #52 Jim McCune airborne!